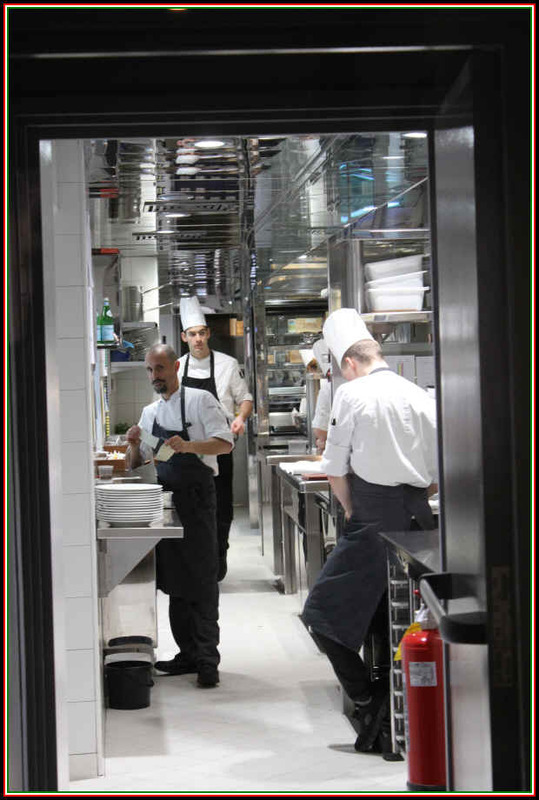 This is a new place, opened in the Summer of 2014, by our old friend Chef Marco (formerly of La Libera). 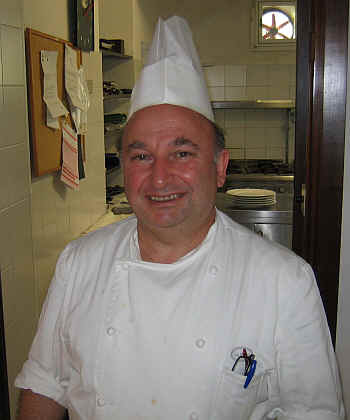 This guy is one of the top chefs of Piemonte...no doubt about it, he's upper echelon in the kitchen. 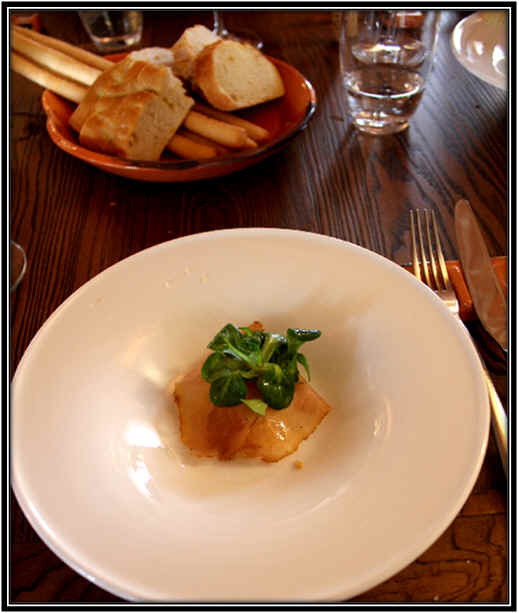 We stopped in and had a light lunch...(if that's possible), tasting a few good plates. In good weather, they may have seating available outside, if I understood correctly. There's a large table near the kitchen, but most likely you'll be guided upstairs to the main dining area. And seating is at a premium. There are perhaps 20 seats, if that many. You'd be best advised to call and book a table. You'll be offered "still" or "sparkling" water...they have a machine which makes their own fizzy water and, wow, was it fresh and bubbly! 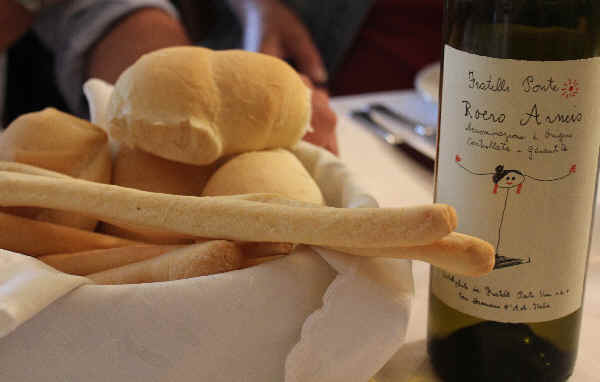 The bread and grissini are excellent, too, by the way. Some peppers stuffed with tuna, I believe. 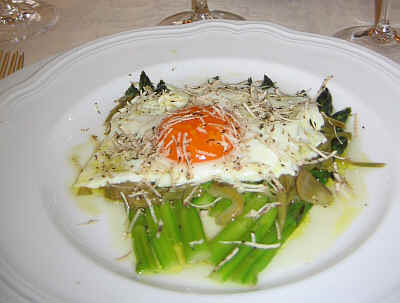 This was a wonderful meal...I will definitely book a table here next time I'm in Piemonte. 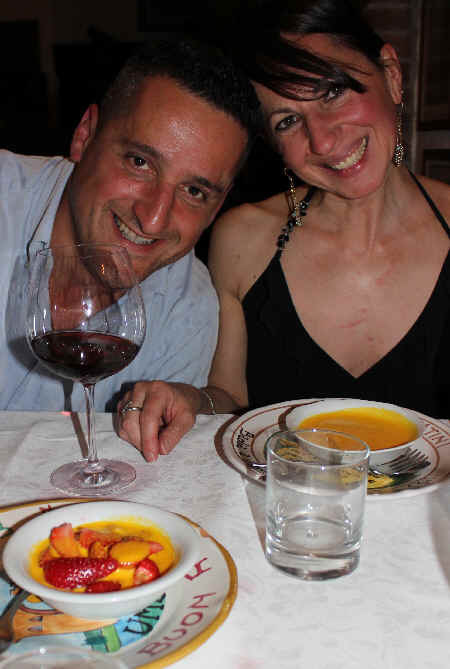 The "King & Queen" of the Repubblica of Perno! It's just off the piazza--Vicolo dell'Arco. You might park a few blocks away...there are several parking lots within a short walking distance. If you have a reservation, you'll go to the door and ring the bell. If reservation they will buzz you in. 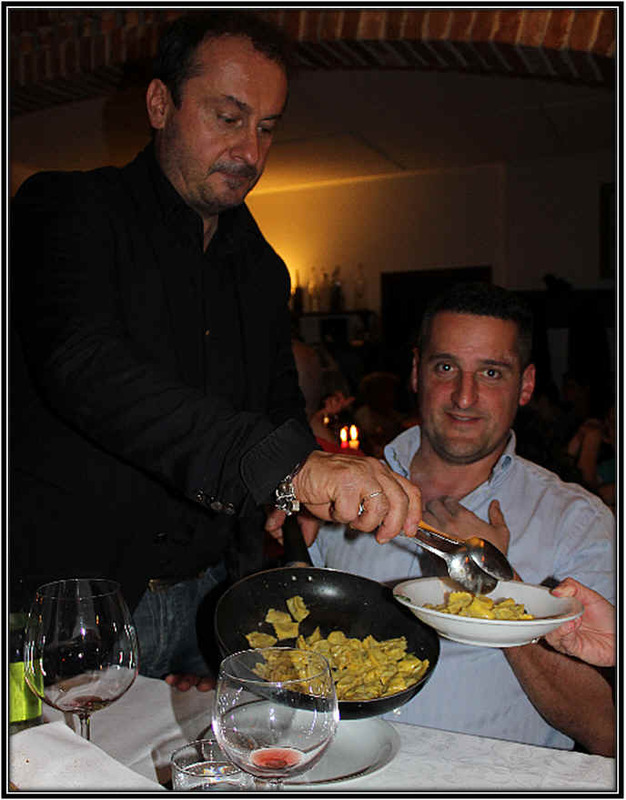 The restaurant is owned by the Ceretto family. 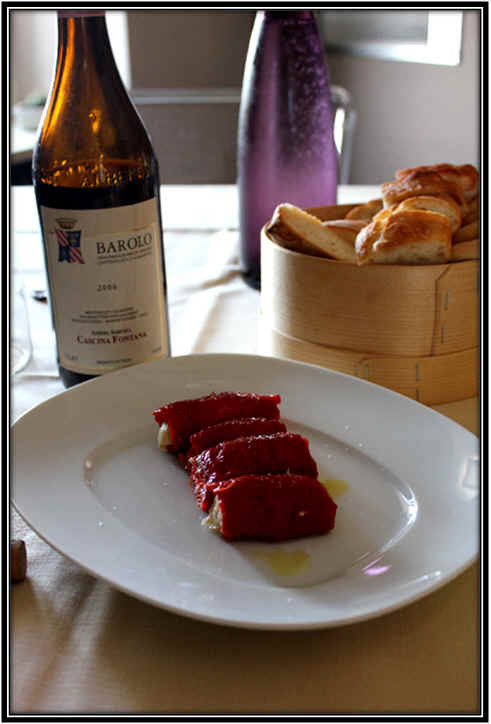 Yes, the winemaking Cerettos. 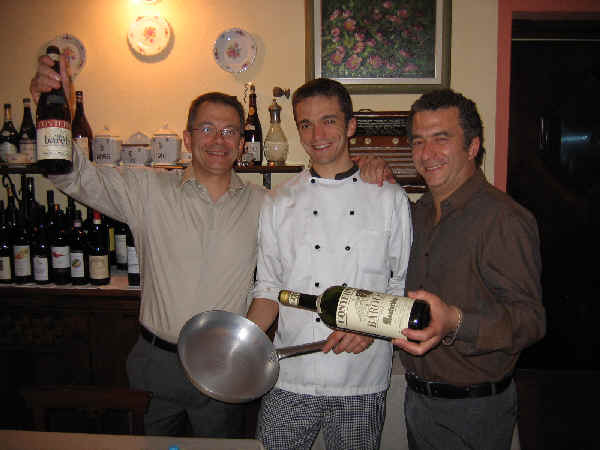 They met a young fellow, Enrico Crippa, who had dreamed of being a great chef and achieving culinary stardom. 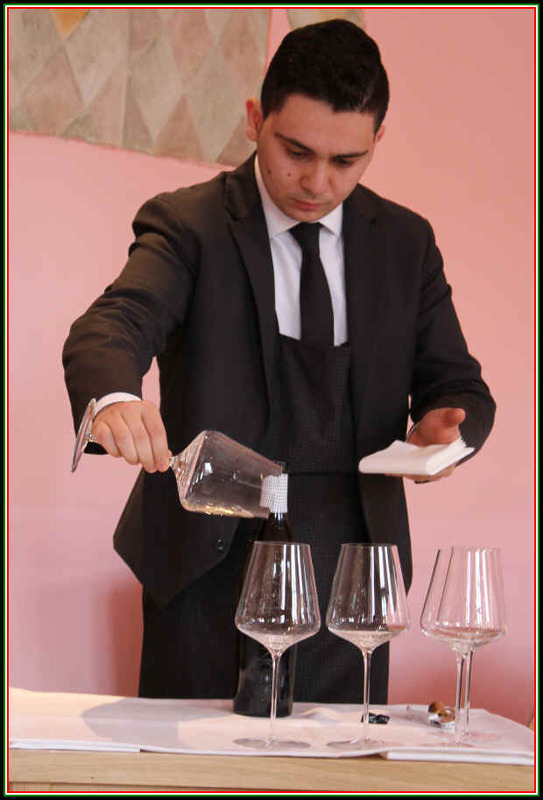 The fellow was working for Gualtiero Marchesi when he was 16 years of age. 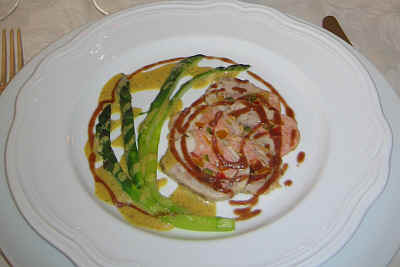 He worked in top restaurants in France and Spain and has extensive experience from Japan, as well. 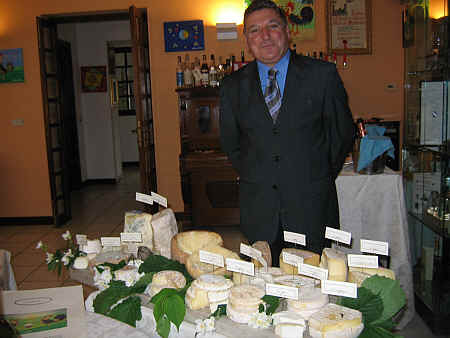 He met the Cerettos in 2003 and a year after opening Piazza Duomo the place had a Michelin Star. 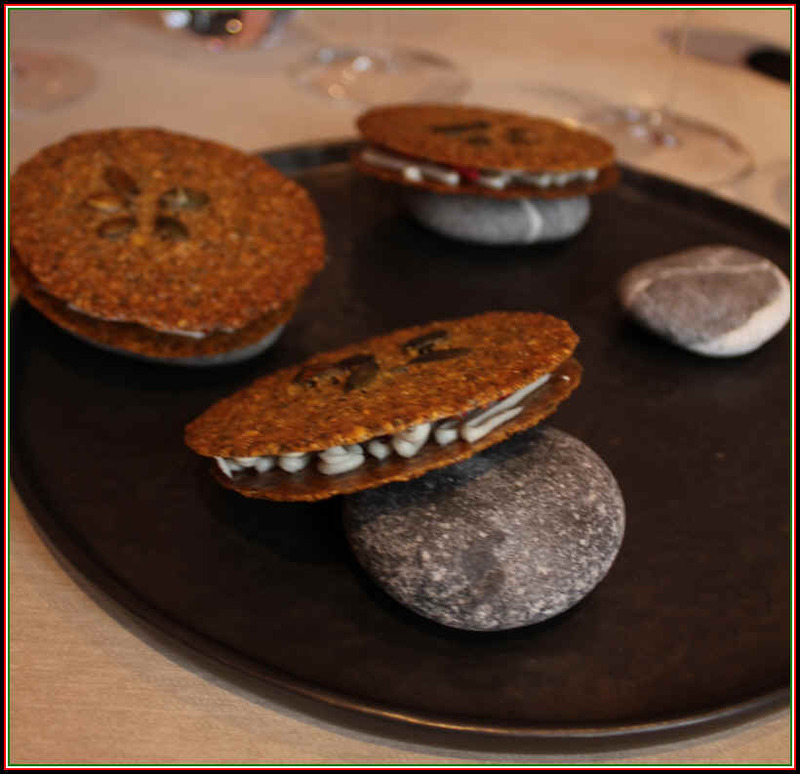 By 2009 they had two Michelin Stars and in 2012 were awarded three Michelin Stars. 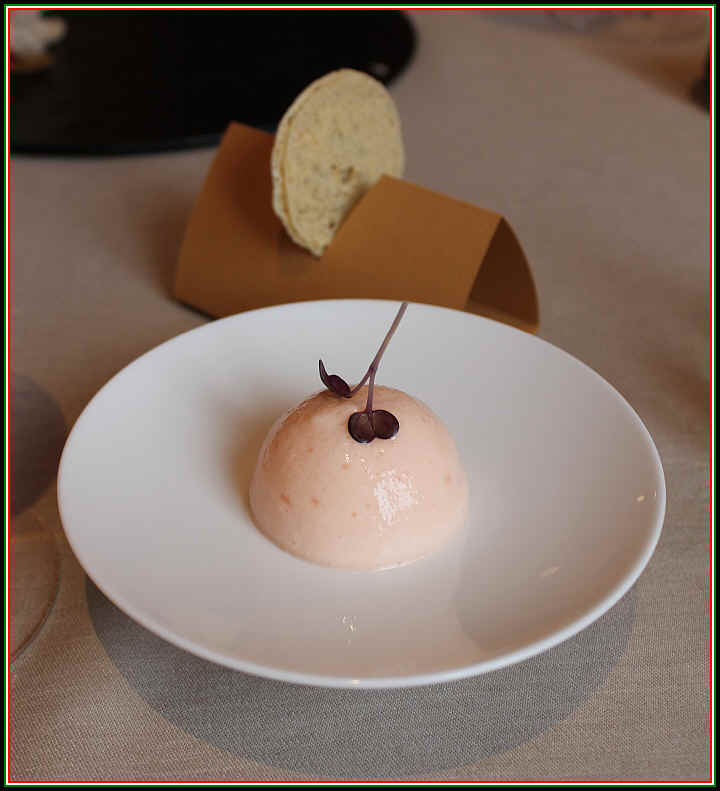 Nine restaurants in Italy were awarded three stars in 2018. 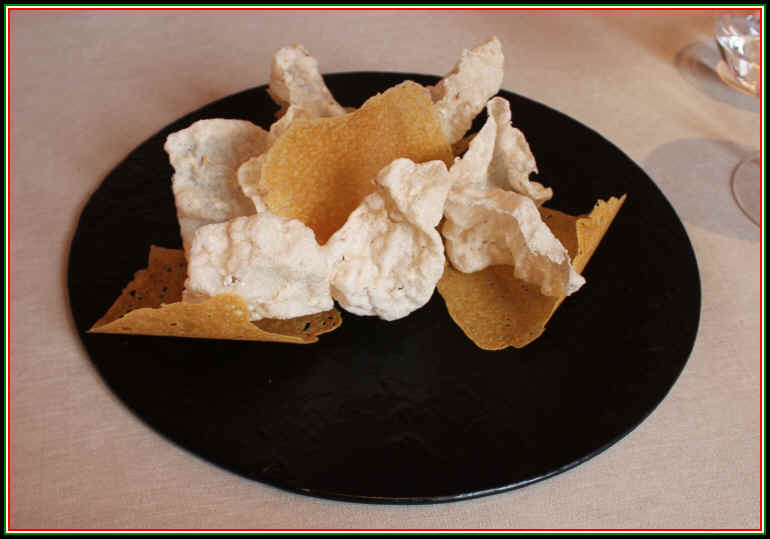 The Cerettos made Crippa a partner in the place and it's a remarkable dining experience. 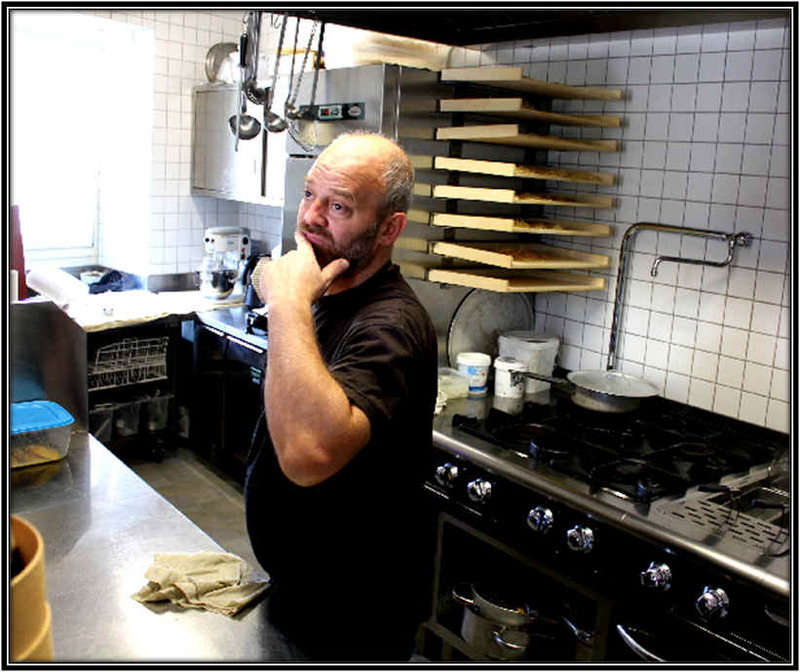 Chef Enrico Crippa manning his battle-station. 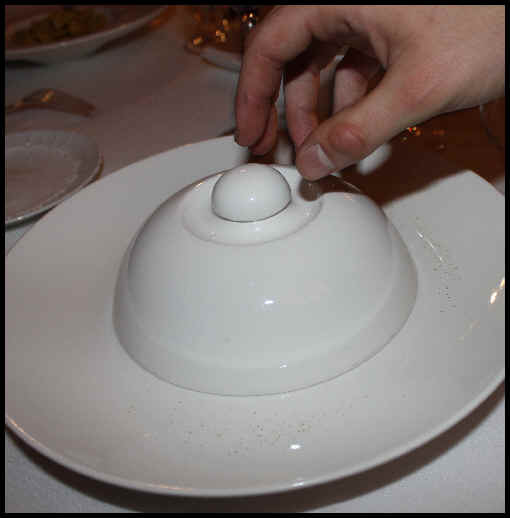 Like other deluxe restaurants, the staff is large and impressively attentive. 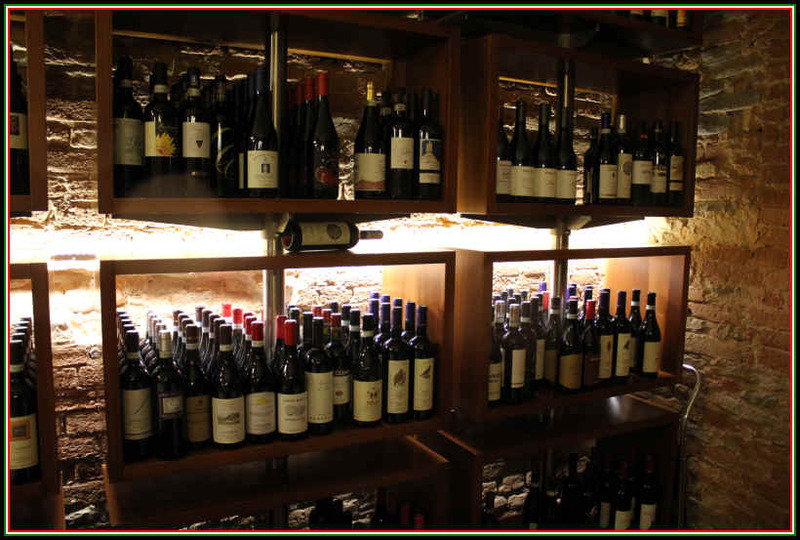 The wine list is incredible and you can spend a few hours perusing the amazing selections. 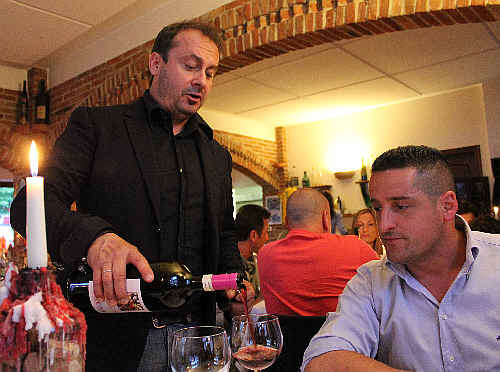 Yes, there are wines costing hundreds of dollars per bottle, but in reading through the list, we were impressed that you can drink well for 40 to 80 Euros, too. 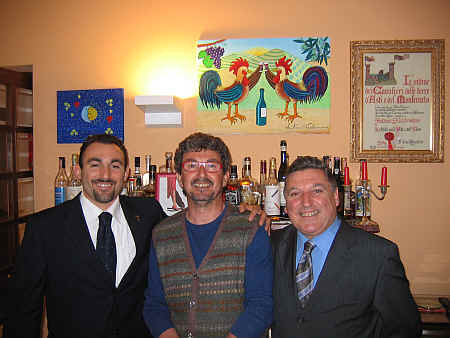 Of course there are numerous bottlings of various Ceretto wines, but other top producers from Piemonte are on the list. 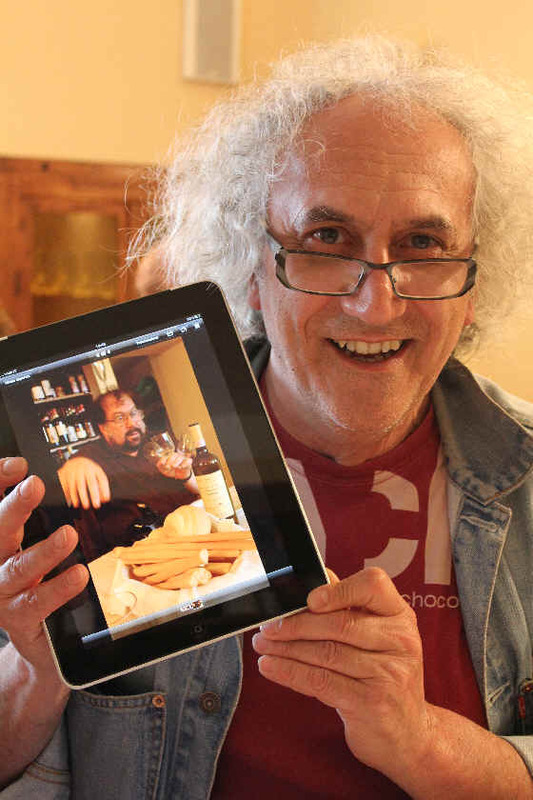 Gaja, Vietti, Mascarello, Massolino, Vajra, Oddero, Germano, Pira, Sandrone and others are on the list. But you will find impressive bottlings from France, too. It's an amazing list. We arrived one weekday afternoon for lunch with some friends. 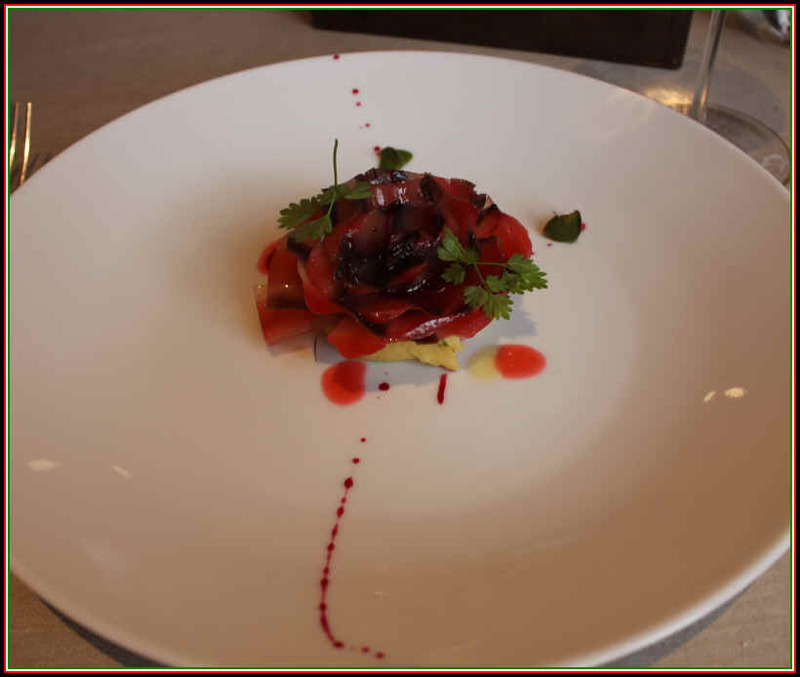 The menu was at the whim of Chef Crippa who put on a remarkable display of culinary magic. 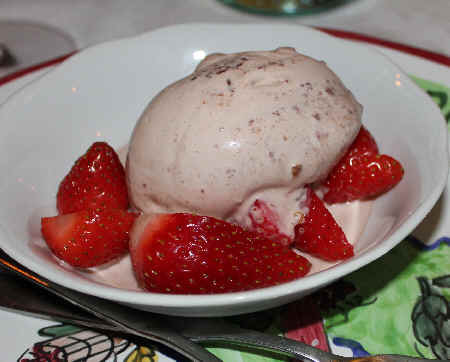 We were asked about food allergies and food "issues" and they did a great job for us. 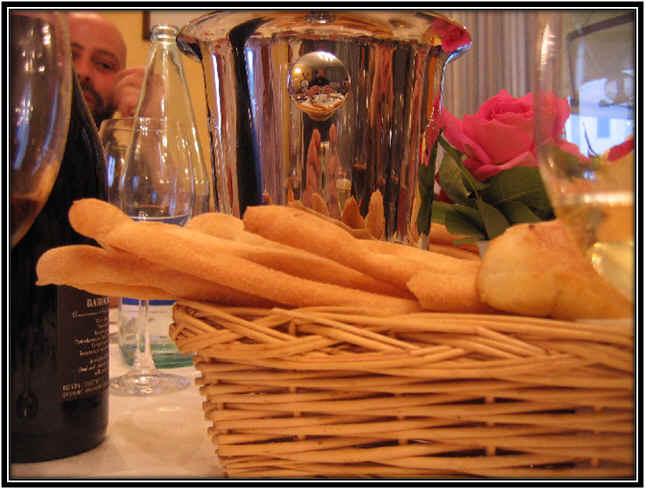 The other slight impediment was we had appointments with wineries, so what might have been a leisurely lunch was jam-packed into two hours. If you go, though, plan dining at this place as the centerpiece of your afternoon or evening (of course). 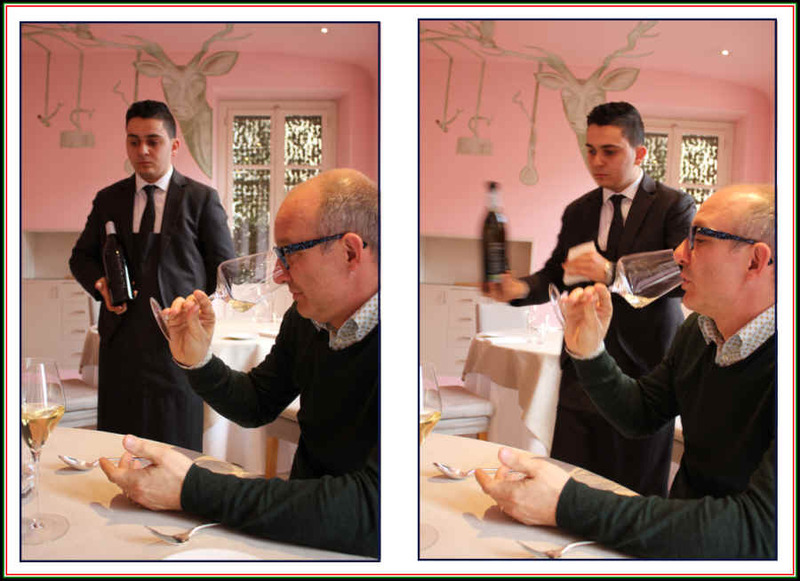 One of the sommeliers shows off a bottle of Spumante and explained its production and aging. 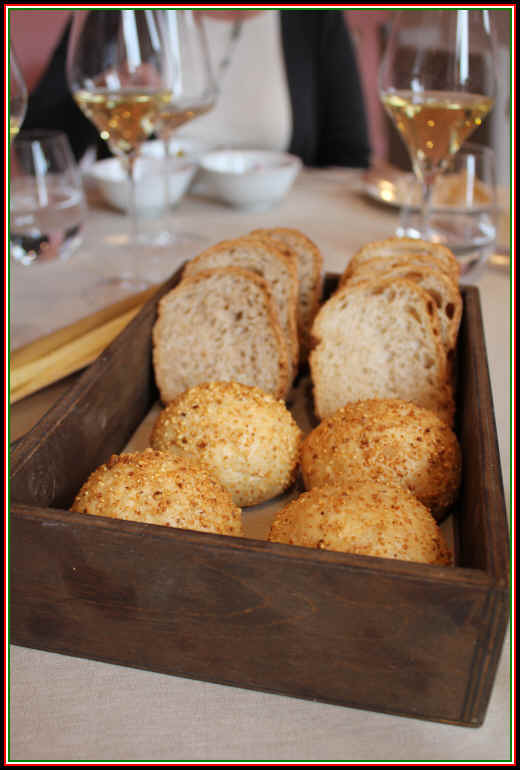 Some nibbles to pair with the bubbly. 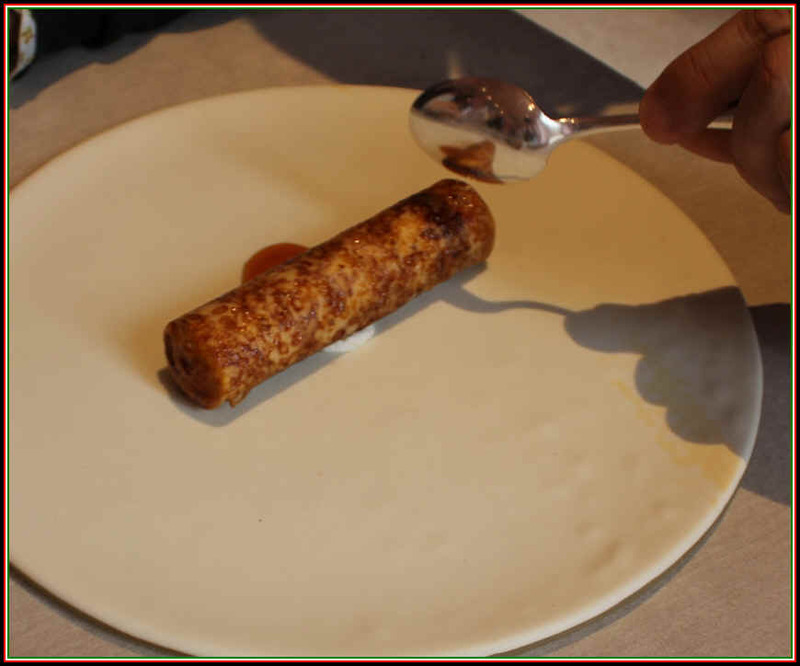 Who would expect some sort of corn with foie gras? Then things really began to roll. 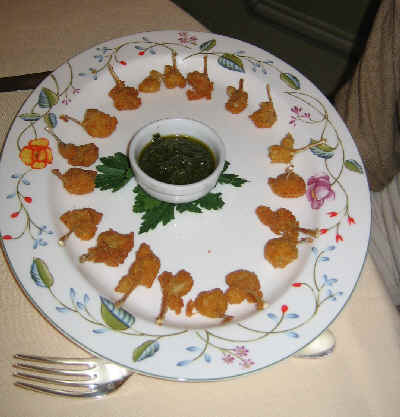 ...and then the entire squadron of Piazza Duomo staffers migrated to our table with small plate after small plate. 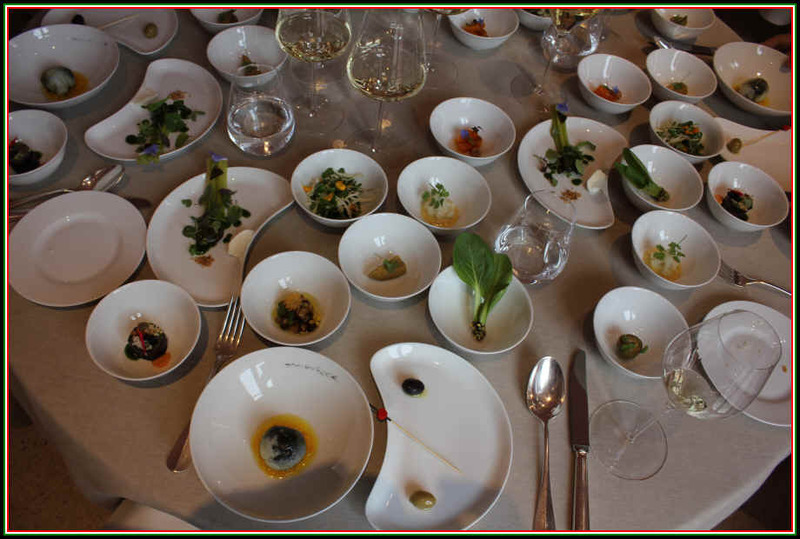 Each little dish was visually appealing, for sure, but each was intensely-flavored, too. 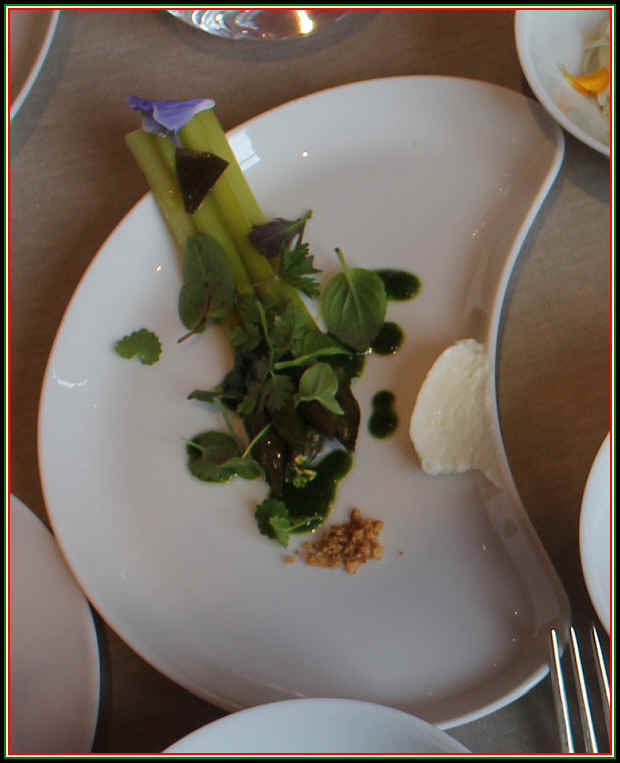 Asparagus...amazingly flavorful and perfectly presented. They make their own breads...very fine! 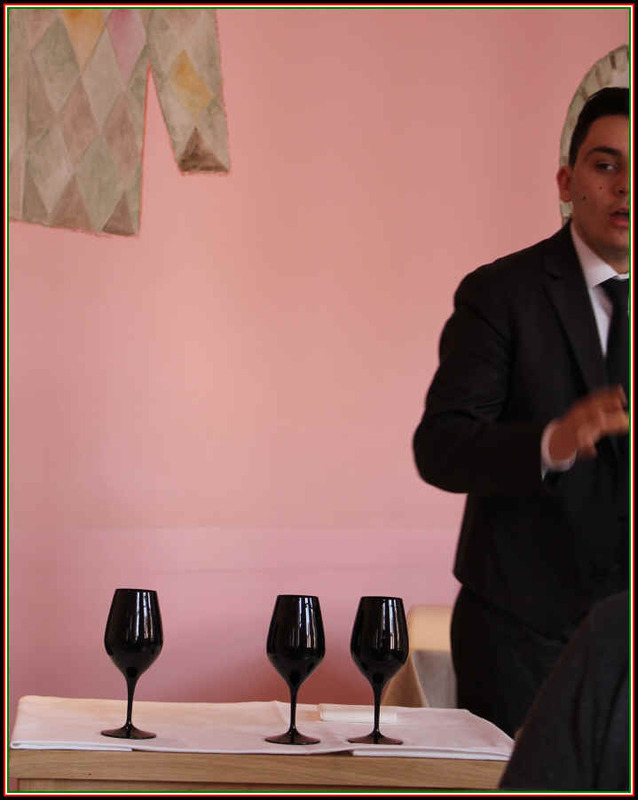 We were presented a "Mystery Wine" poured into black glasses. 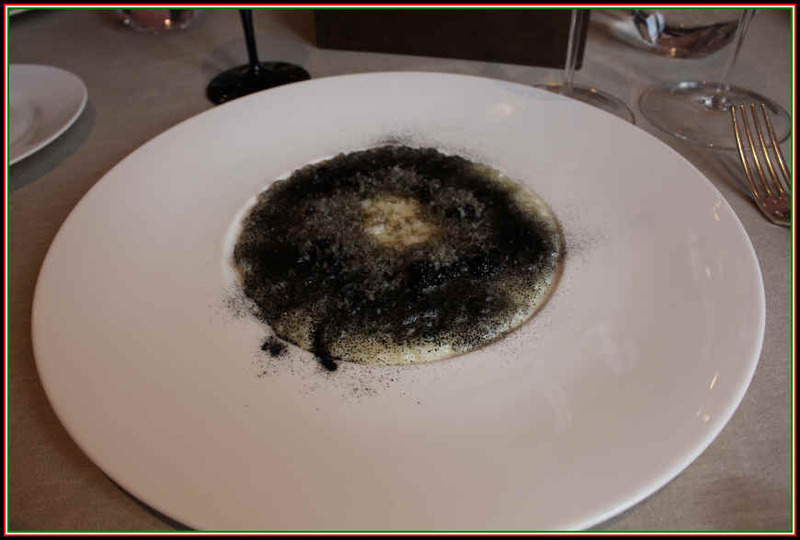 And we had a Risotto as our main plate. The mystery wine smelled woody or toasty as though it had seen some oak. Was it a red? Was it a white? 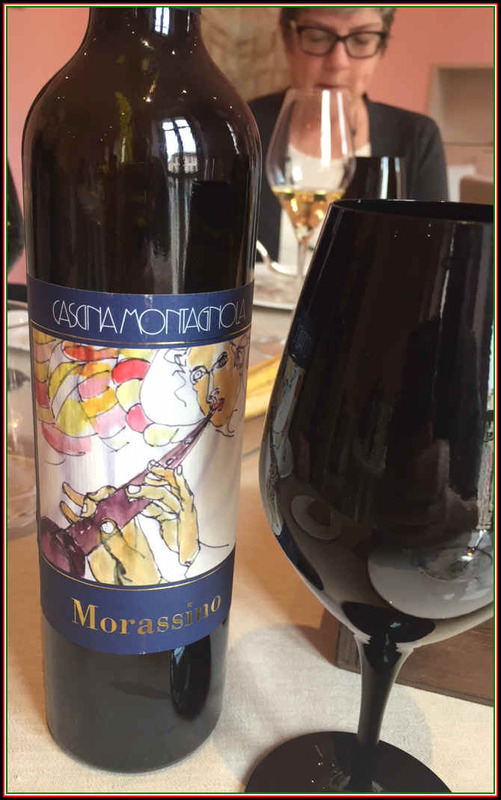 Cascina Montagnola's "Morassino"...A Late-Harvest Timorasso. This wine spent 20 months on the yeast sediment and this is where it picked up that seemingly woodsy, "toasty" character. 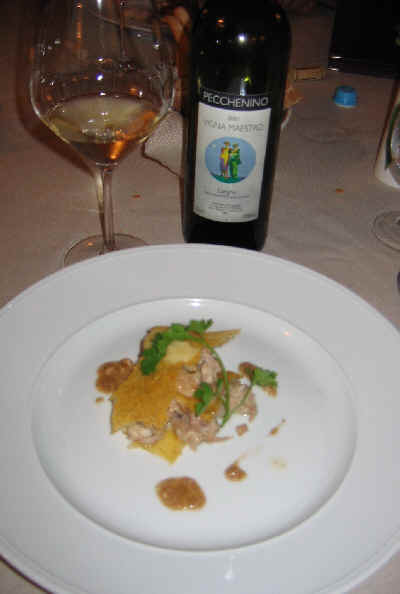 This was a great match for the risotto, surprisingly. Next came a barrage of sweets. 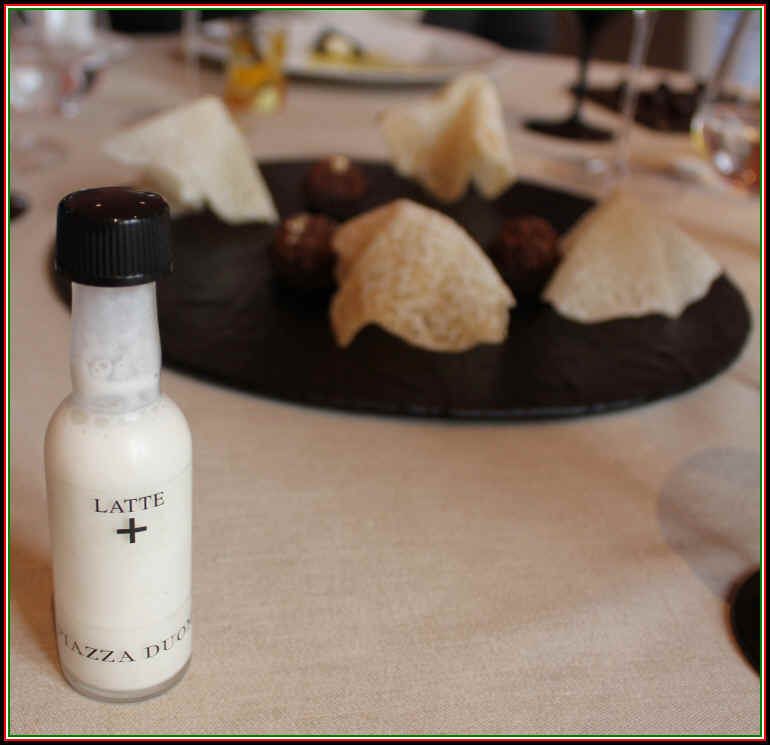 Yes...three Michelin Stars and they have guests drinking a little shot of "Latte" directly from a tiny bottle! We had to run off to visit a few more wineries that afternoon...but we did see an impressive cart full of post-prandial potations. 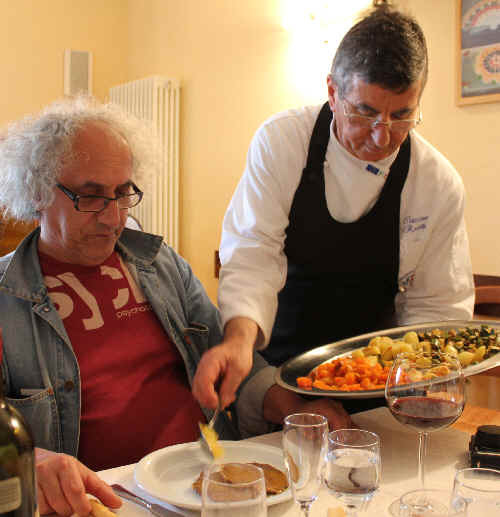 Noted winemaker and gourmand, Sergio Germano, extended an invitation to dine at this family-operated trattoria. 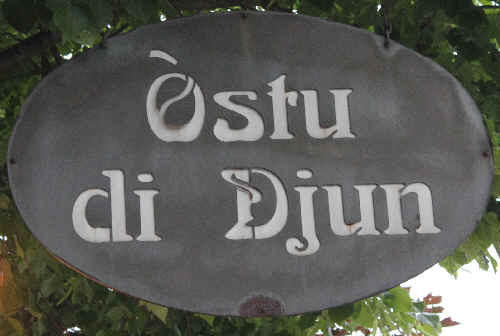 We gladly accepted the invitation, having heard good things about the three brothers who run this place up in the hills. It's a 20 minute ride south of Serralunga. We arrived on a Friday night and found the place packed with locals. 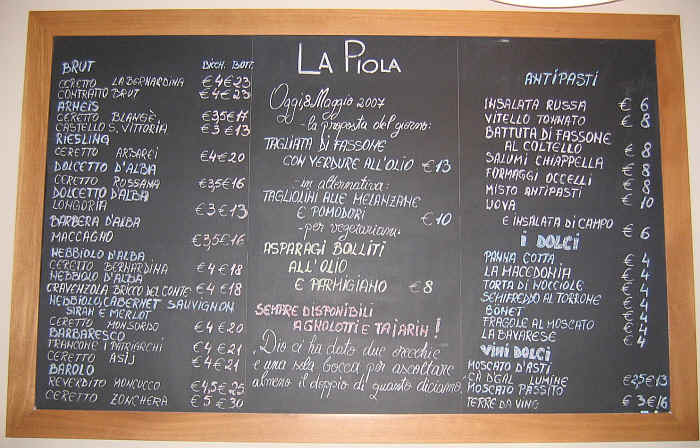 The wine list is impressive...lots of local vintners are represented, by there are numerous wines from other regions around Italy. 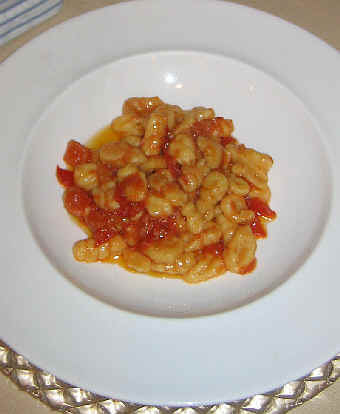 Millefoglie di Quaglia with polenta. 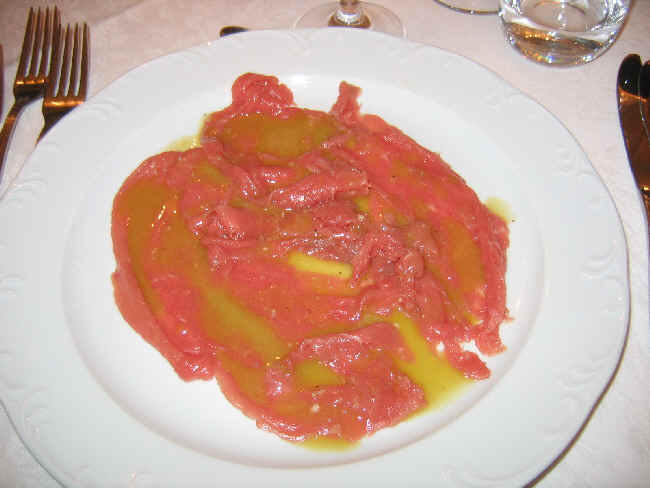 Coda di Vitello con tartufi. 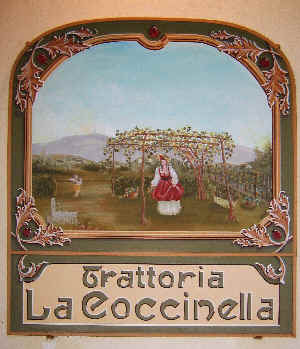 La Coccinella is a magnificent, soulful place for a good meal of typical Piemontese dishes. 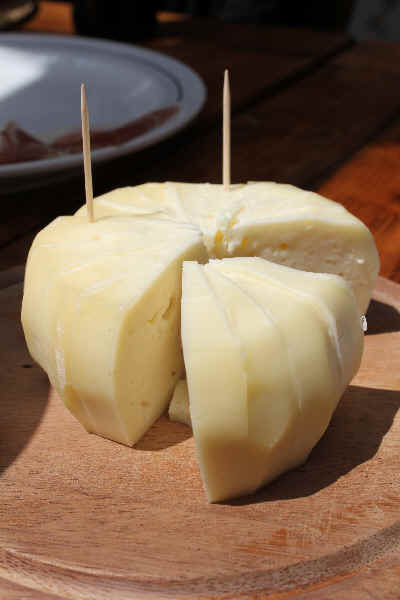 You're out in the countryside, well away from the "big" city of Alba and outside the tourist areas. The one caution I'd have is be sure you can find your way back to your hotel safely. I've passed by this place for years and never stopped in. 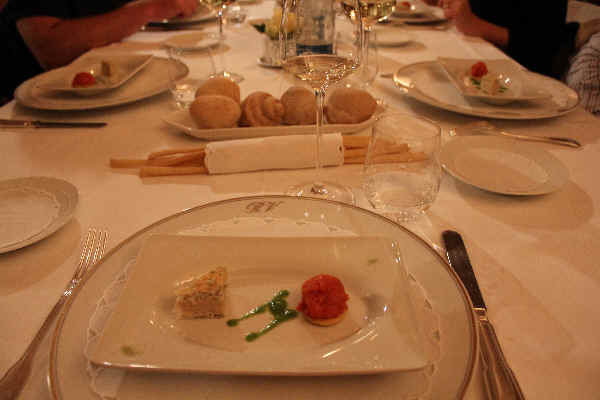 But in 2015 I had a chance to dine here at lunch and had a splendid, elegant meal. The restaurant is under new ownership, too. Two young couples are partners in this little place. 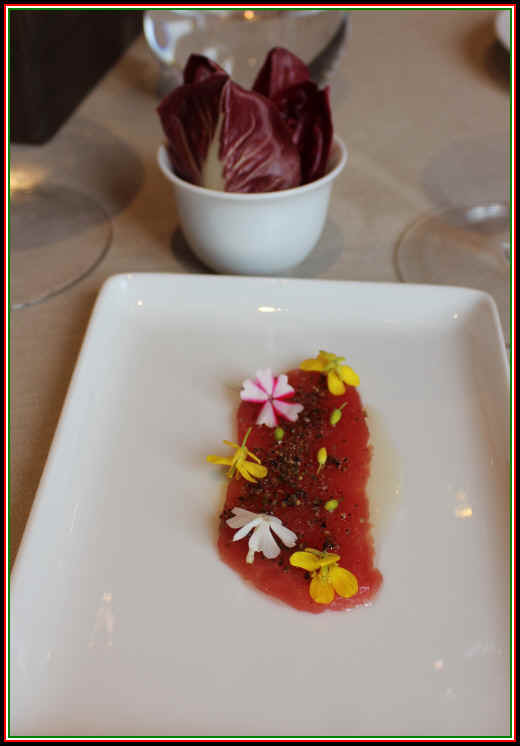 There were 7 antipasti offerings when we were there...including a Swordfish "Crudo" with Shrimp, Vitello Tonnato and a version of Carne Cruda. 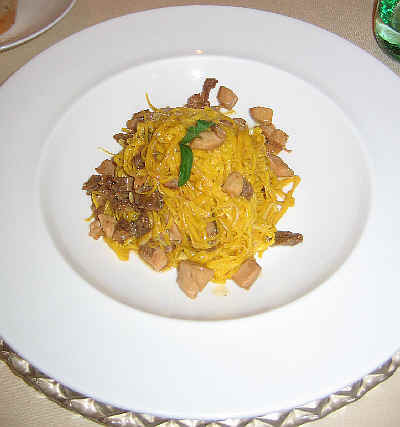 Five "pastas" (two were soup, actually). 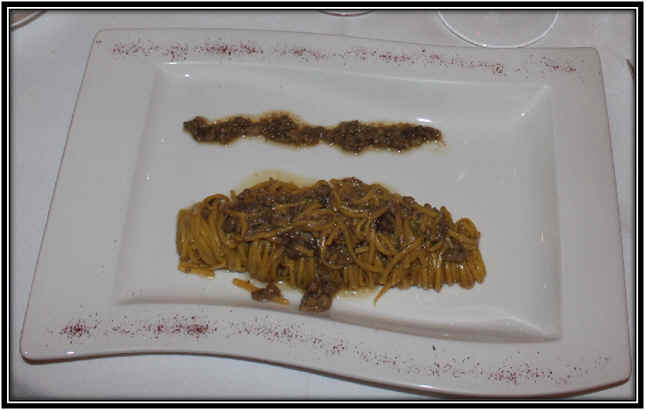 Six main plates, including Roasted Lamb, Tripe or, if you're really adventuresome, Finanziera (a mix of organ meats, typically). 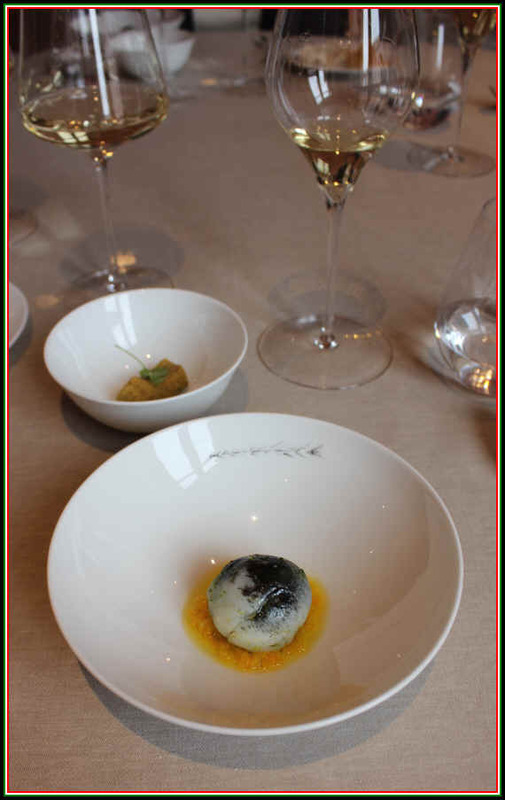 A little Amuse Bouche was delicious...some sort of smoked fish. 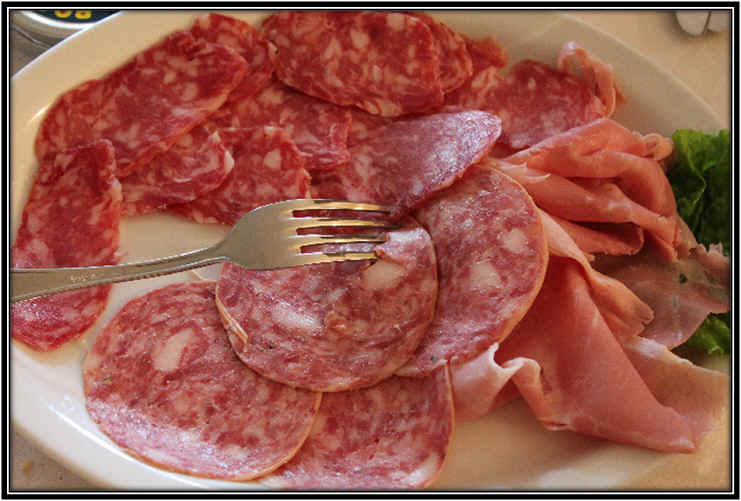 For a starter, our friend Silvio ordered the Cotechino. 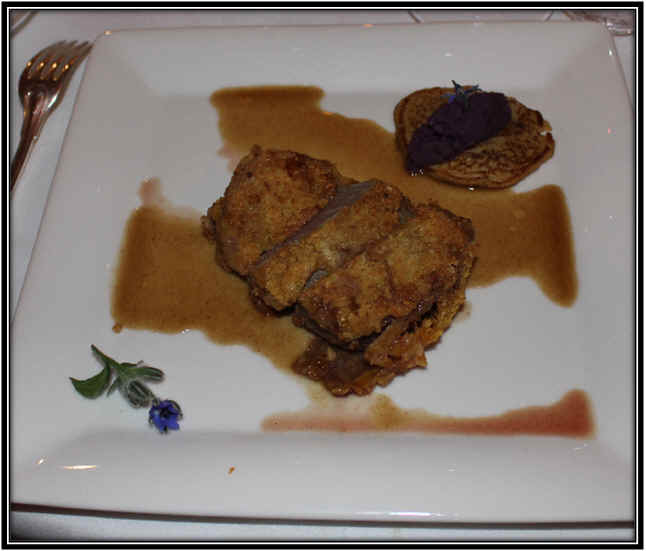 It's served on a bed of potatoes and topped with Fonduta. ...is elegantly presented. 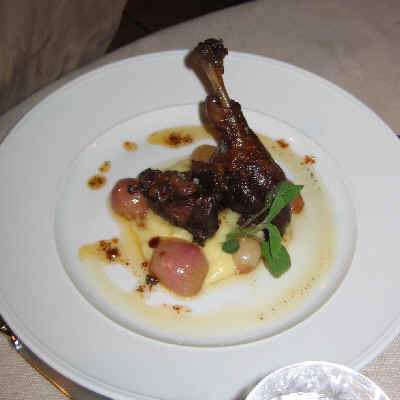 It's meat from a veal shank served on a bed of mashed potatoes. 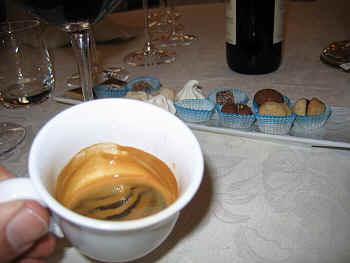 As we were a bit pressed for time, we skipped dessert, but did have a lovely coffee. This is a lovely and comfortable place. I did not see the wine list, though. During warmer months, I believe they offer outdoor seating with a wonderful view of the vineyards near and far. 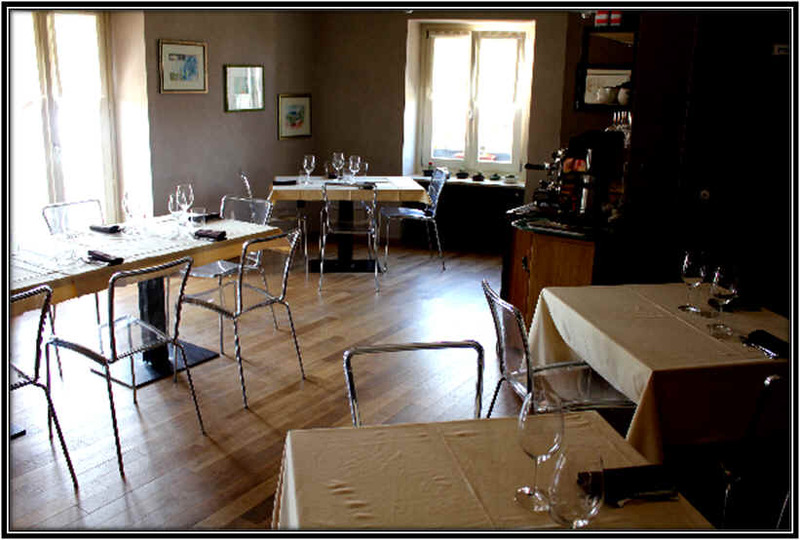 This is an elegant, old, traditional place about a ten minute drive south of Monforte. 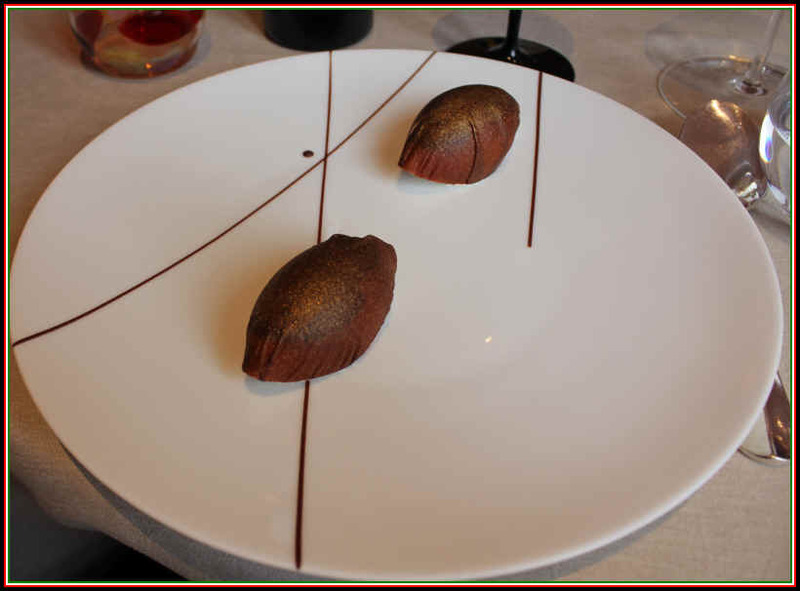 Despite its elegance and refinement, it's still a comfortable "family" restaurant and a good dining experience. 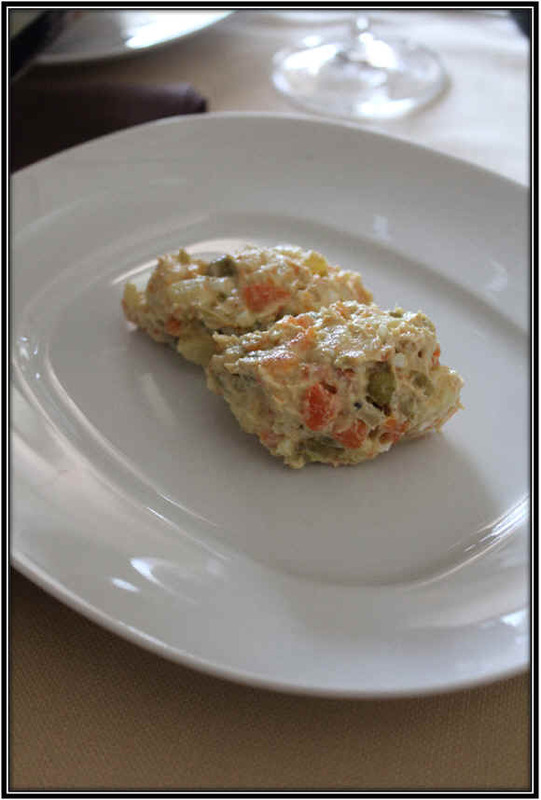 Some sort of stuffed onion and cheese starter. 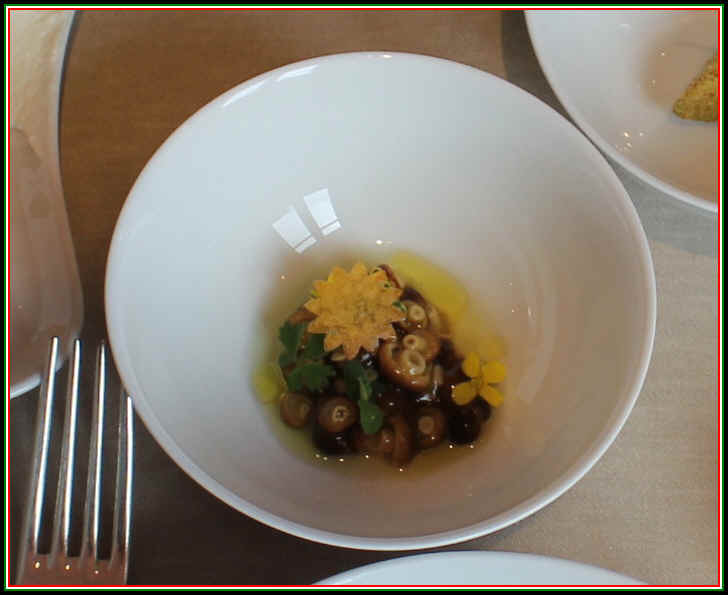 Bagna Cauda was on the menu and I could not resist...the pepper was filled with the "bagna" mix...anchovies, garlic, olive oil. It's quite intense and, frankly, too much for one person as a starter. But I forged ahead valiantly. Our dear pal Ceri Smith (that's her Witness Protection Program name) ordered some sort of salad...and we had a bottle of Pelaverga from Verduno. 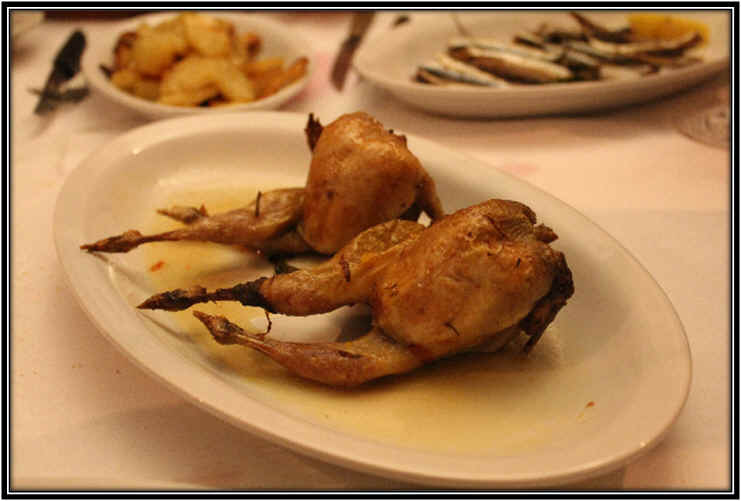 Our friends were thrilled to order frog's legs for a main plate. 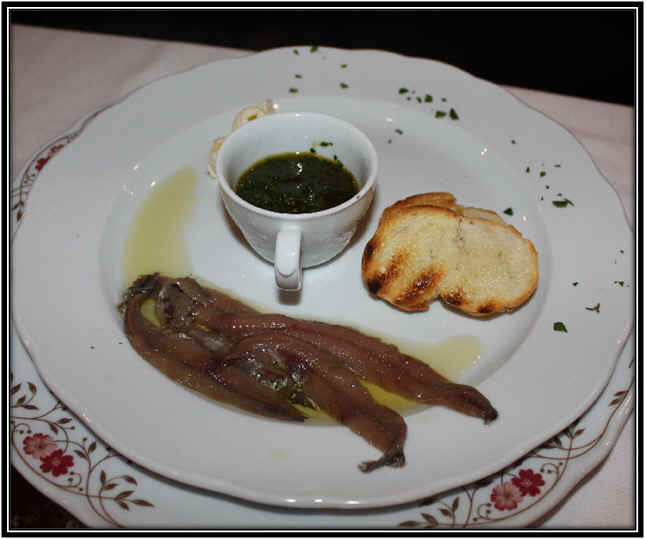 I thought they were more like legs of tadpoles, but they sure were nicely presented and delicious! La Posta is a bit "out of the way" and known mostly to locals. 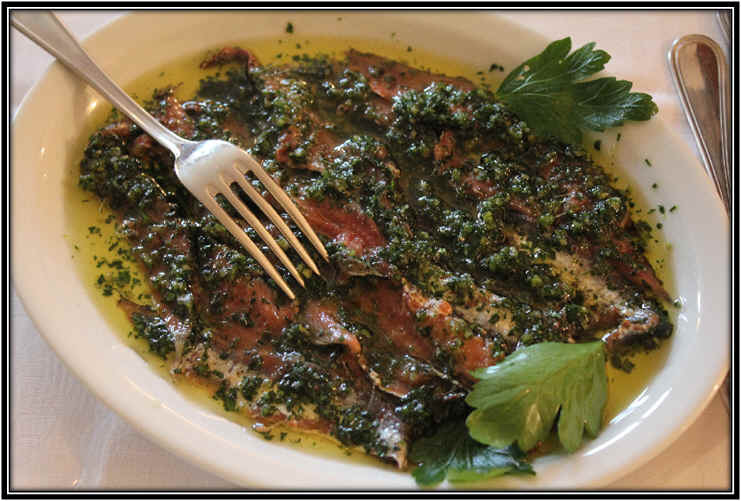 It's a comfortable dining experience, with spacious dining rooms, a calm, quiet ambience and friendly, gracious service. 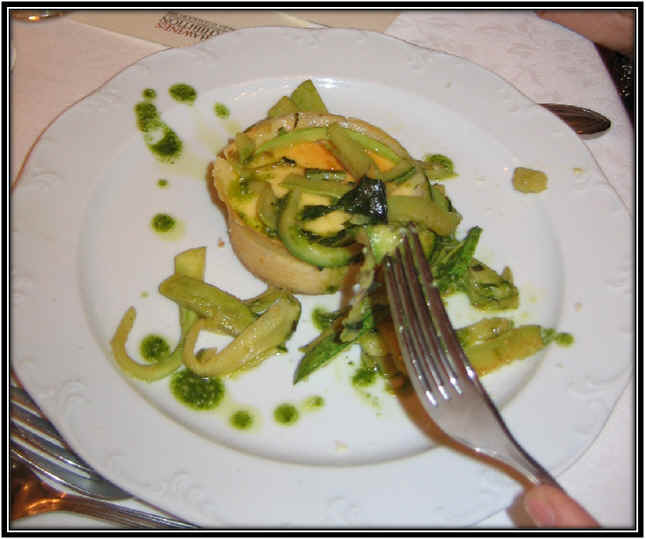 The food is classic Piemontese cooking...not modern, artistic, fusion (or confusion) cuisine. The wine list is quite good and they have all the top producers featured. 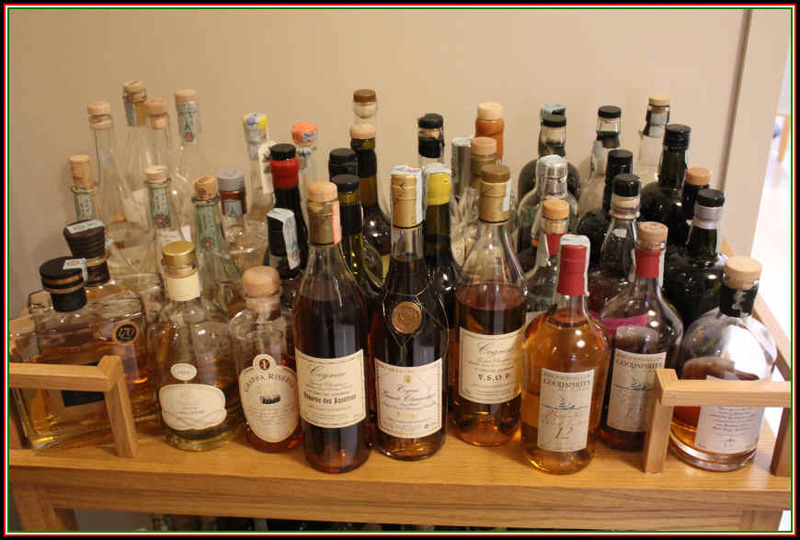 You can find older vintages and more current bottlings and wines in a good range of price. This is a wonderful, family-operated, fancy dining room and they have some hotel rooms, as well. It's a place frequented rented for small conventions, weddings and parties. 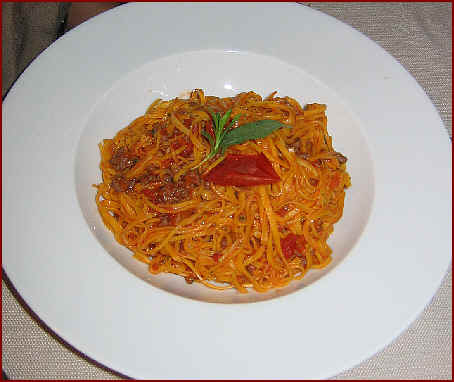 We dined there on a Saturday night and the place was busy, but with such spacious dining rooms, quite comfortable. 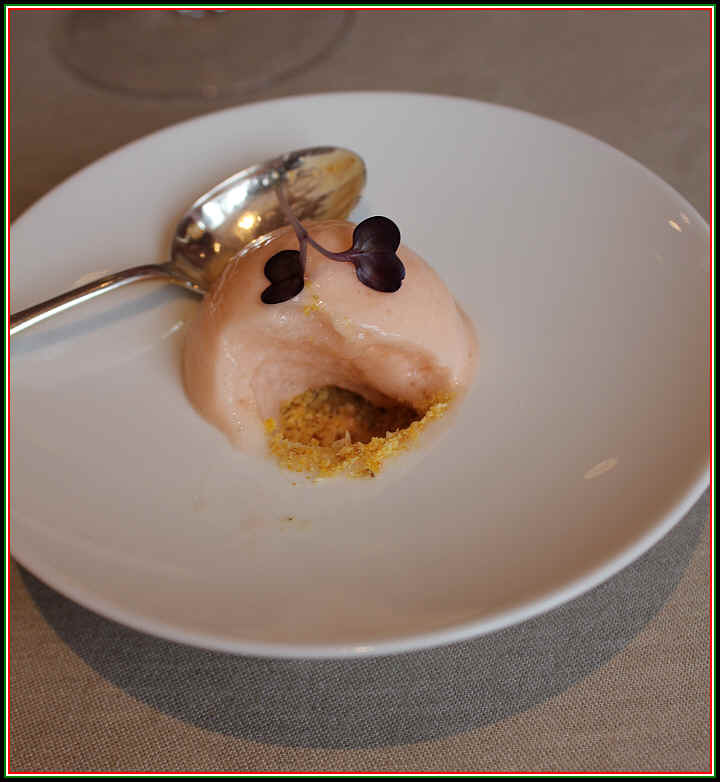 Dinner began with a small "Amuse Bouche." Our friends brought a bottle of Napa Cabernet they'd acquired in California a year, or so, earlier, while on vacation. 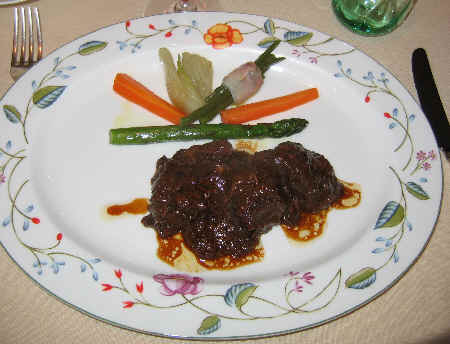 A beef dish...quite intense and rich. 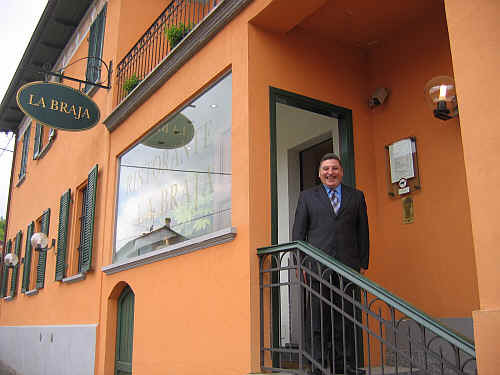 This is an old time, old-fashioned place in Barolo. 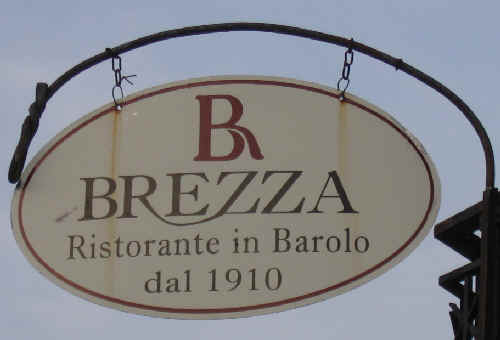 The Brezza family makes good wine, as well as running a hotel and restaurant. 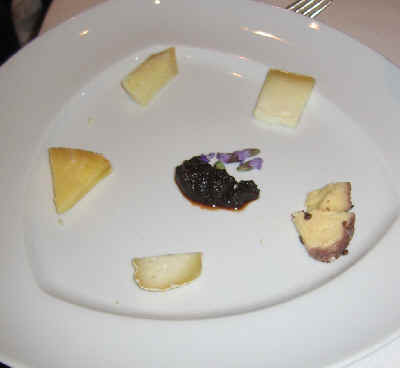 The fellow sitting next to me was allergic to cheese and asked to skip the Flan course...me too. 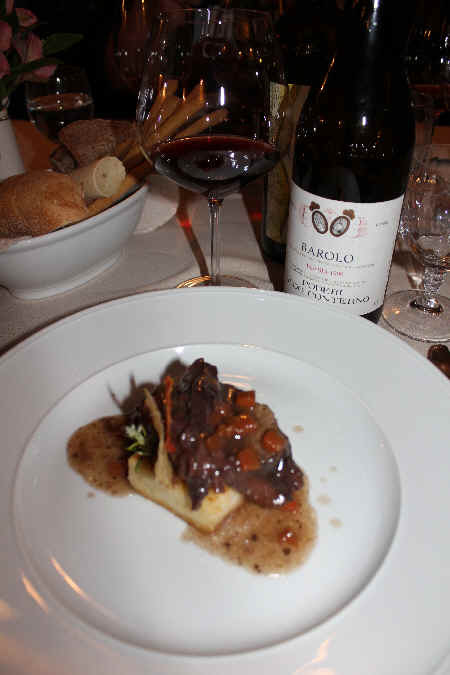 They selected a great main course to pair with the wonderful Barolo wines from the various vintners in attendance. 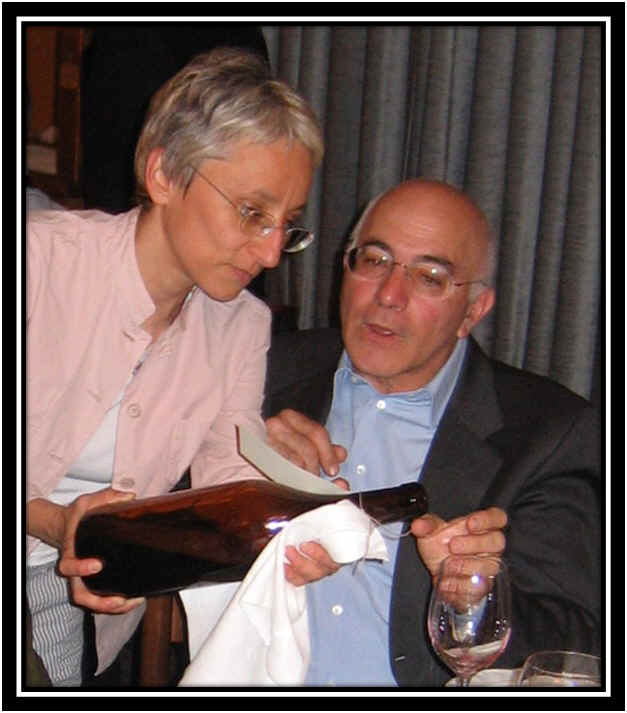 I'm reasonably certain Aldo Vaira was not suggesting Maria Teresa Mascarello buy some French oak barrels for her Barolo. Closed Tuesdays all day and Wednesday at lunch. Closed for vacation in February and March and from the end of July through mid-August. 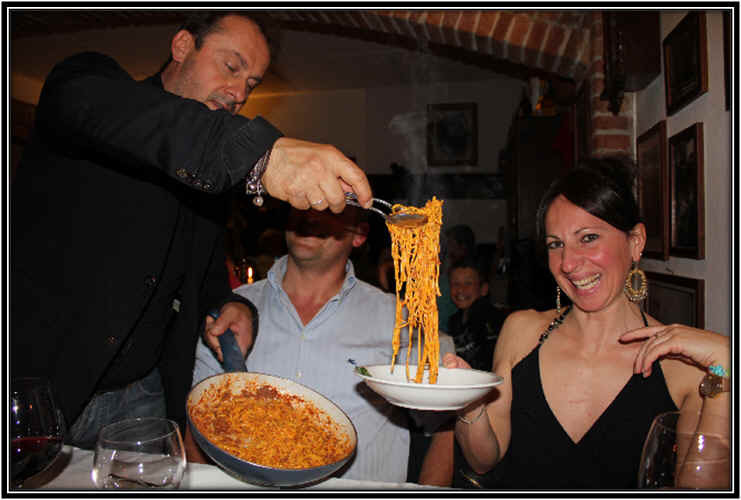 Chef and owner Massimo Camia is busy in the kitchen preparing lovely and elegant Piemontese cooking, while his wife, the charming Luciana, oversees the staff in the upstairs dining room. The place is rather small, seating only about 40-50 people. 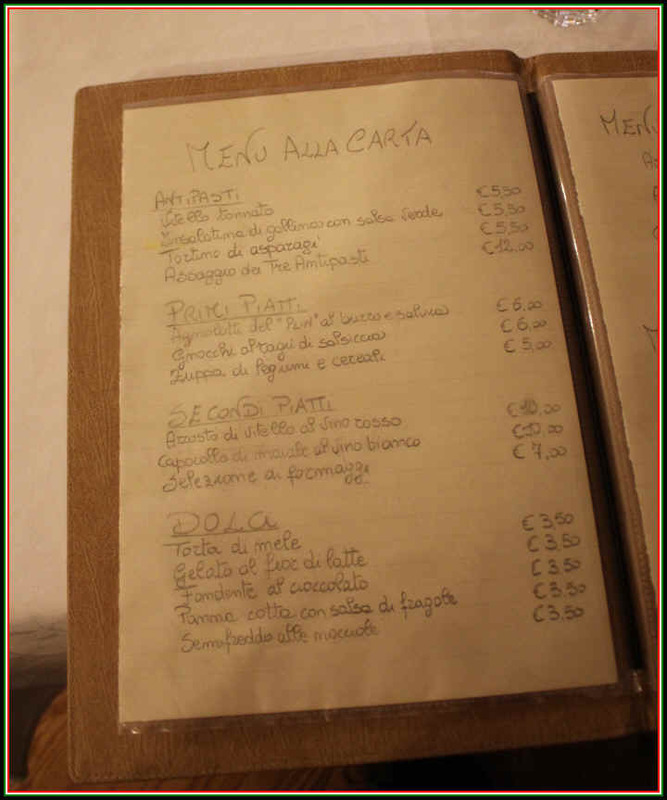 Reservations are a good idea, since we've noticed a fair number of locals dining here along with the tourists from overseas and elsewhere in Europe. 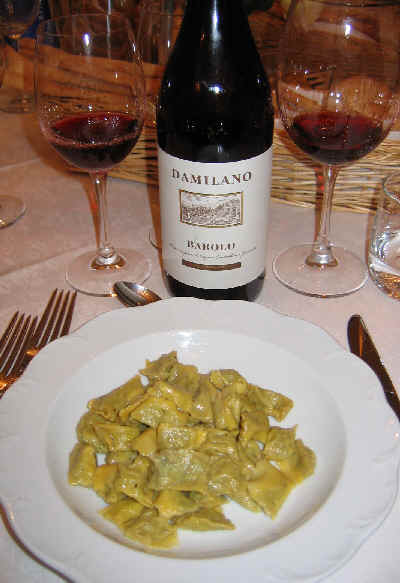 The new restaurant is located in a place own by the Damilano winery, hence you'll find a good selection of Damilano's wines in the cellar. The wine list is impressive...a Who's Who of Barolo, but with some wines priced reasonably and others costing a bit of a premium. There's quite a good spectrum of wines on the list and you can drink well for small money or splurge a bit. The dining room is bright and comfortable...quite nice, actually. 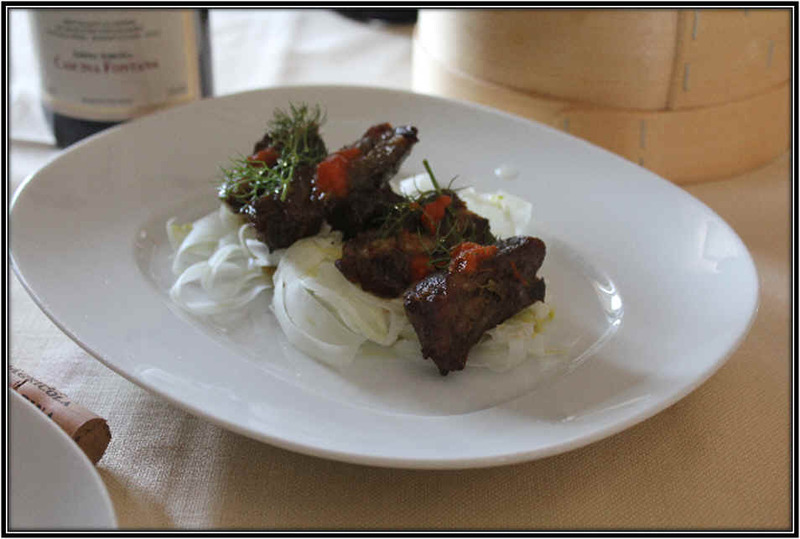 The menu is varied, but features local ingredients and Piemontese cooking with a modern and light touch. 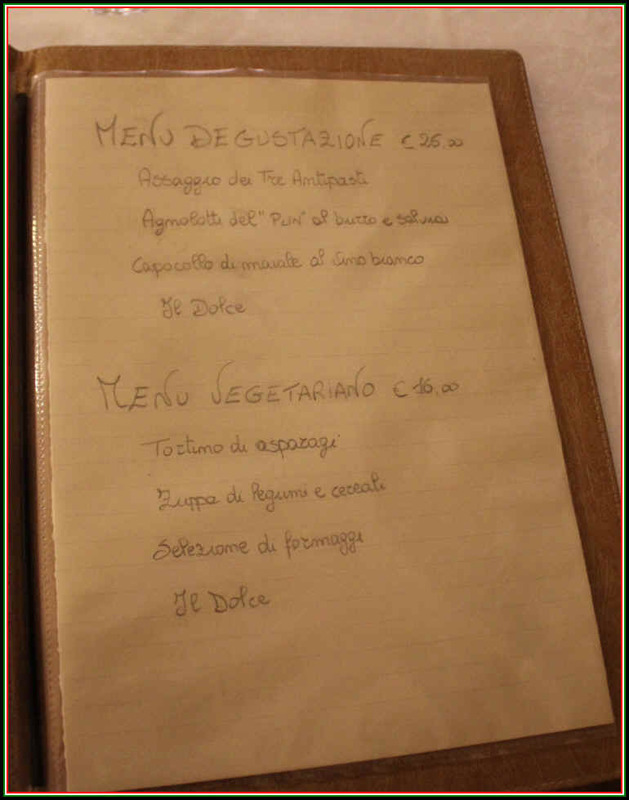 I have not been to their place in its new location, but I've retained my original write up...I look forward to checking out the new place, which friends who live in the Langhe say is really excellent. Closed Wednesdays and Thursdays at lunch. We were the guests of some friends at this place one lazy, warm day near the harvest. 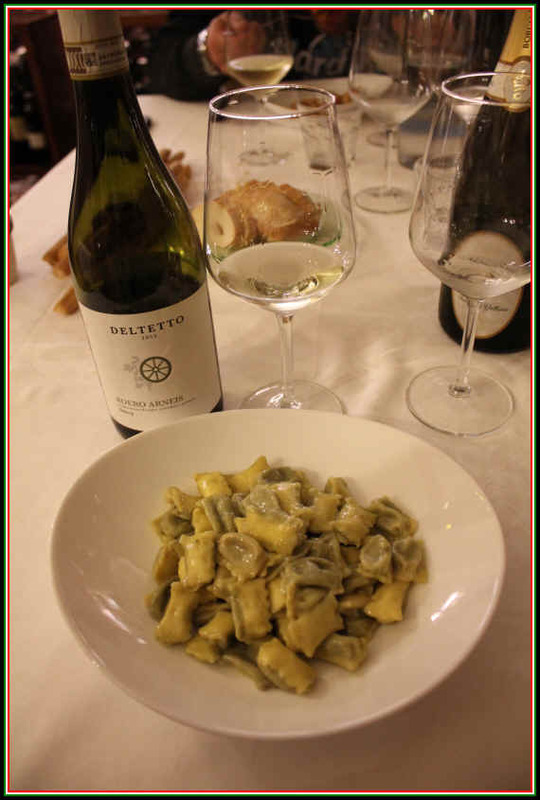 Most of the diners were seated outside on the terrace overlooking a number of hills and valleys of the Langhe. The menu was pre-arranged and the young lady who was serving our table indicated she could also take care of the vegetarian in our party. 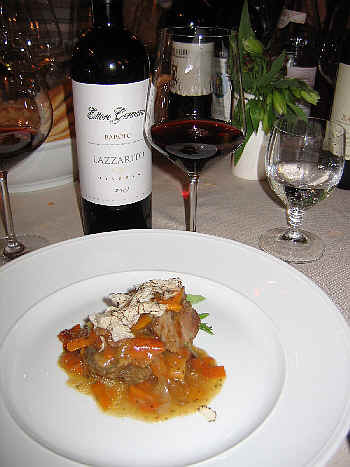 We had a terrific bottle of Dolcetto with a memorable lunch. 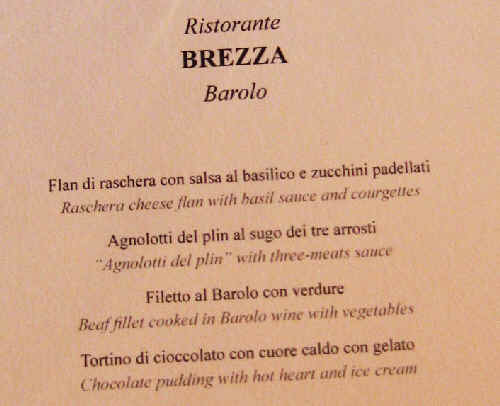 The menu was varied, including a risotto, "plin" (the pinched little stuffed pastas common in Piemonte's Langhe) along with some sort of roasted bird. 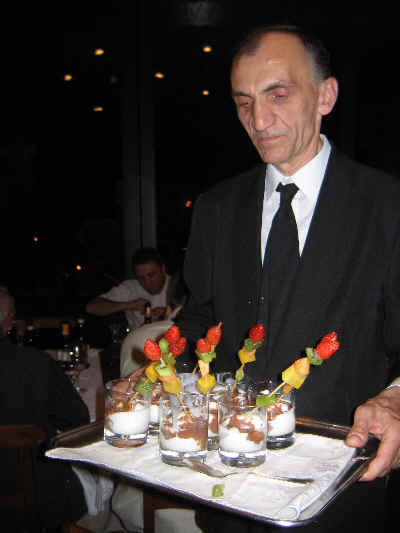 The restaurant has been there a long time and has been under the same management for more than a decade. 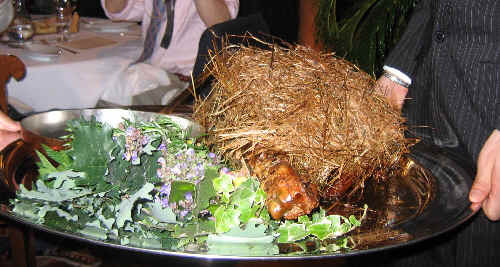 I was privileged to dine here at at large feast organized by the local grower's association in May of 2007. The food was good, but I will say it was very salty for my tastes...your mileage may vary. 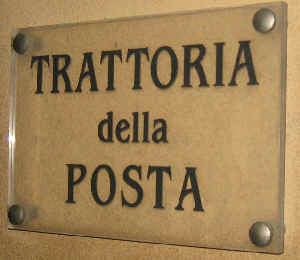 Today many Langhe friends place this as the Number 1 dining spot in the region. 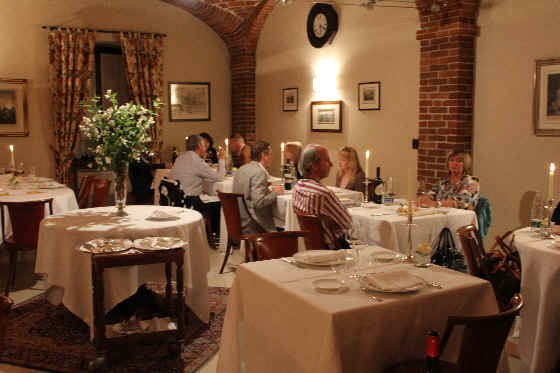 The cellar is extensive and the food, they tell me, is exceptional. 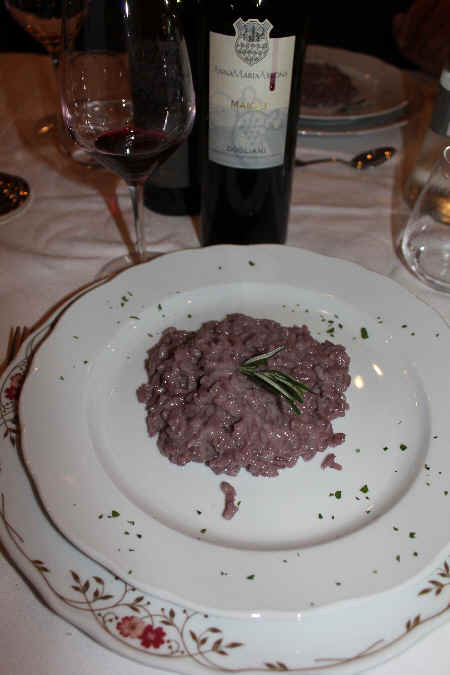 Saffron Risotto and a nicely-oaked Barbaresco. Closed Sunday nights and Mondays and they closed from Mid-to Late December until Late January. 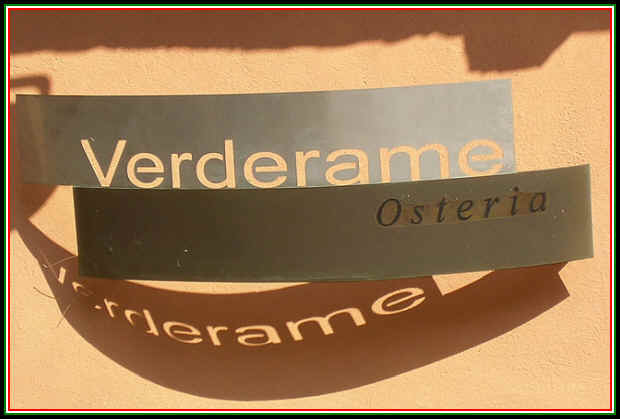 Owned by the Ceretto family, famous producers of Albese wines, there is a more fancy restaurant one level above this ground floor, informal osteria. In warm weather, there are tables outside in a covered area. 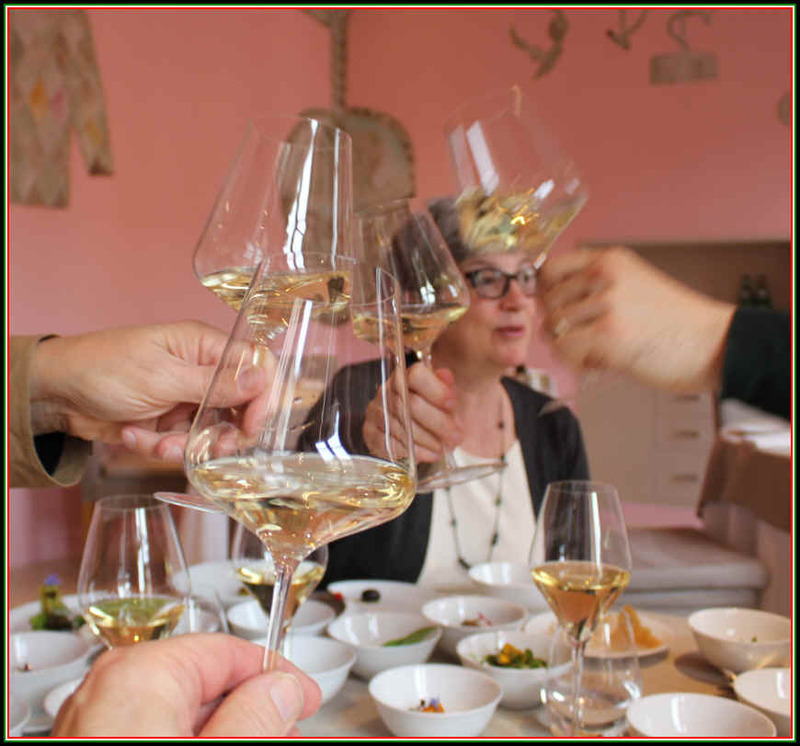 A small group of us arrived one Spring afternoon and ordered a bottle of Ceretto's Arneis, a rather commercial, lightly fizzy white wine. 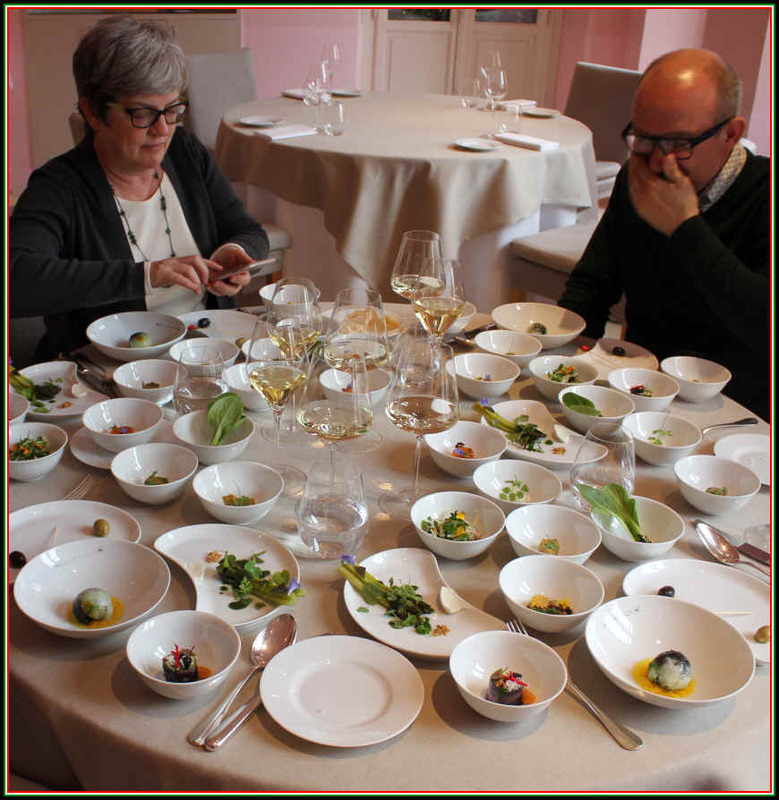 The waiter, seeing seven of us, asked that we try to order the same plate for everyone to make life easier for the kitchen. 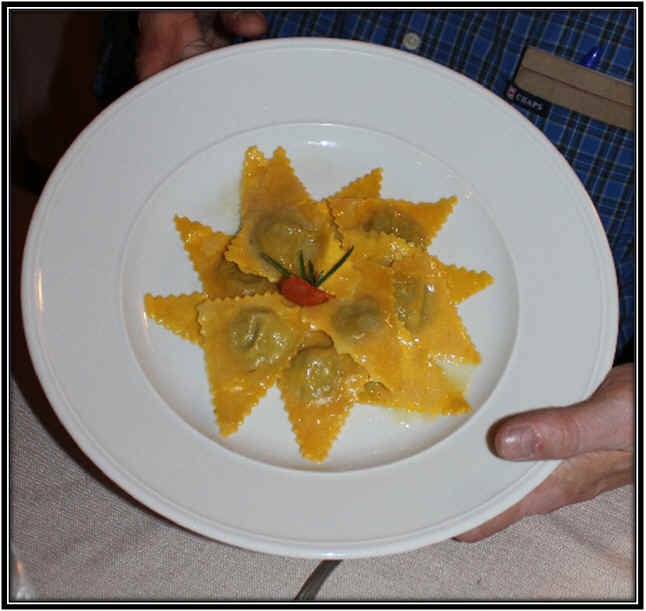 We had a range of antipasti served family style and I think everyone opted for the Agnolotti which were excellent. This is one of those "good eats" places...informal, nicely done and reasonably priced. 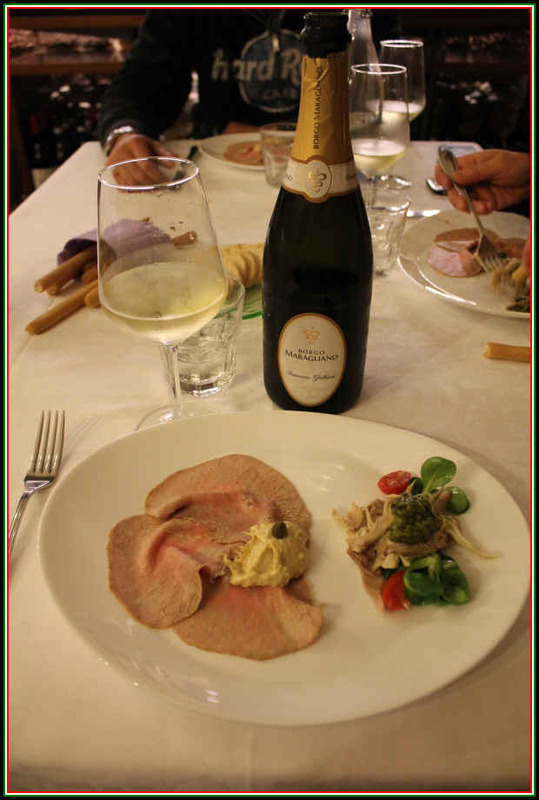 The Vitello Tonnato, a very typical Piemontese starter, was exceptional. 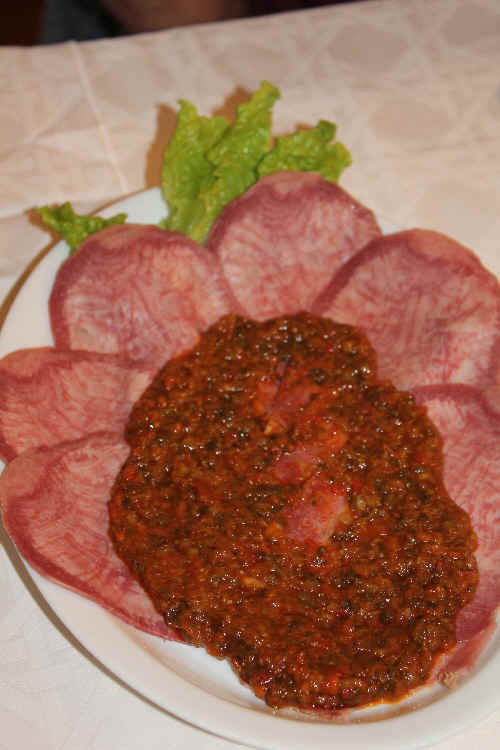 The Carne Cruda was also wonderfully prepared. 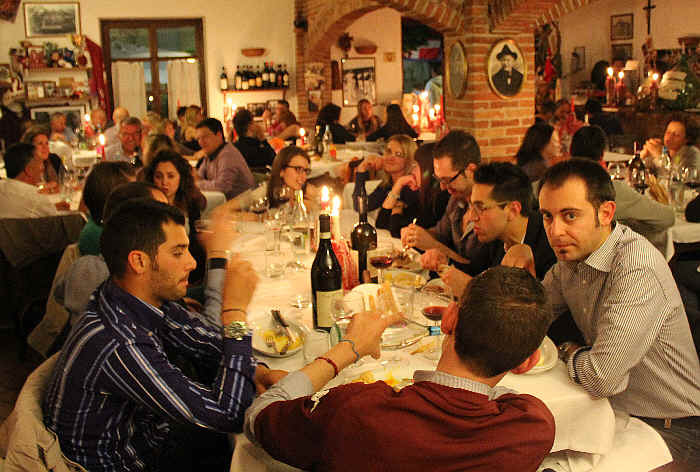 We were guests of a group of winemakers from the Dogliani area on a Friday night. 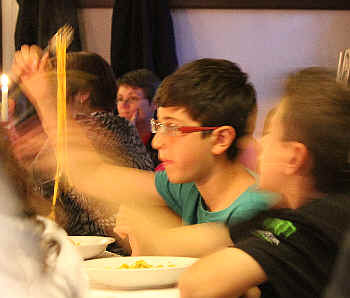 The place was rather busy and we had one of their dining rooms to ourselves. 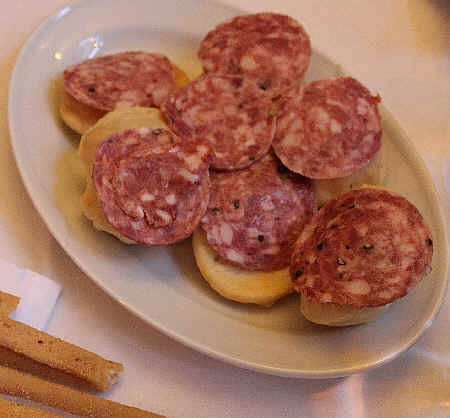 Antipasto, including the famous "Salsiccia di Bra." Reservations advised...the place is packed with locals...not tourists! This is one of those places frequented by the neighbors, but it's not a restaurant catering to foreign tourists. The tables are large, typically seating 6 to 10 people. There's no menu...you'll sit down and someone, perhaps the owner, will come to your table and ask what you'd like to drink. They have a few shelves with magnum-sized bottles on display and they seemed happy to open any one we liked. 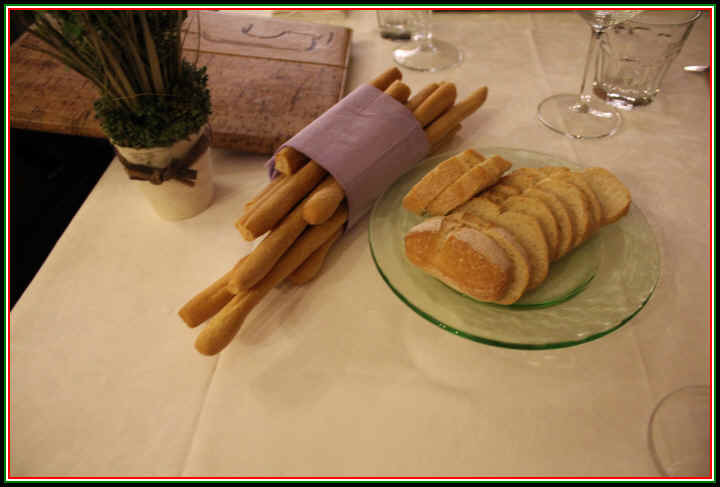 Of course, there's a basket of bread and grissini on the table. 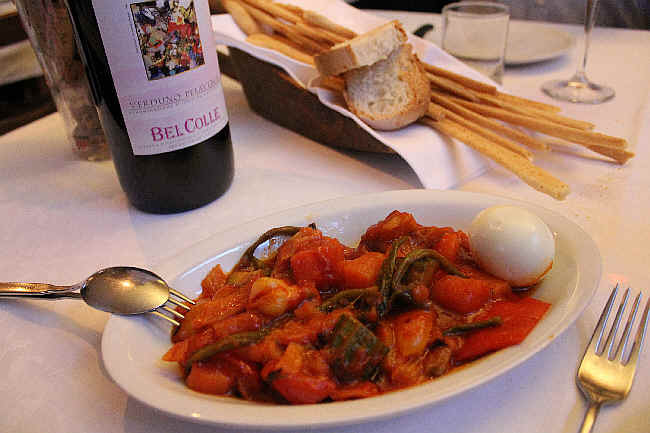 We began with Bel Colle's Pelaverga, a light, berryish red particular to the town of Verduno. 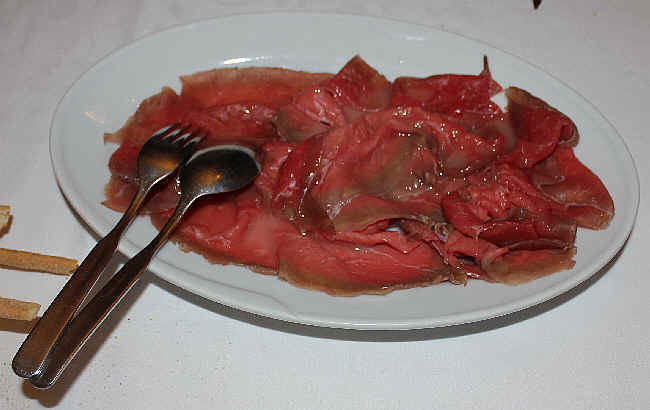 And the proprietor, friendly with Massimo and Lara, now brought a pan of fresh tajarin. 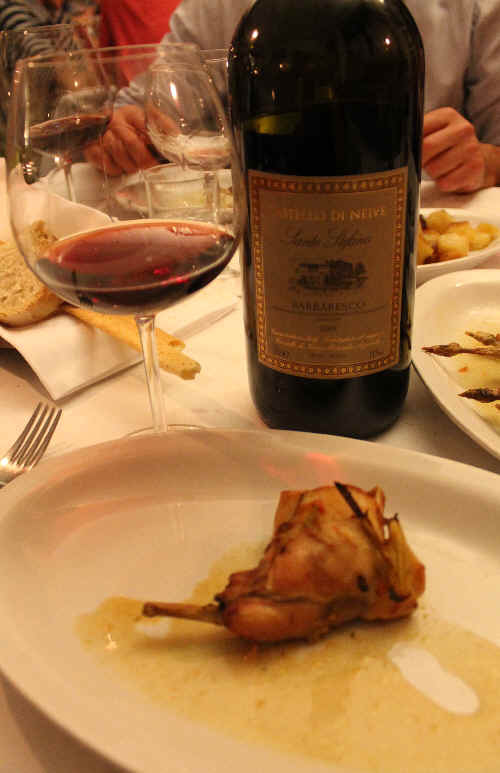 I was seated near the wine display...and noticed a Castello di Neive Barbaresco "Santo Stefano," a fairly fancy wine for this sort of place. 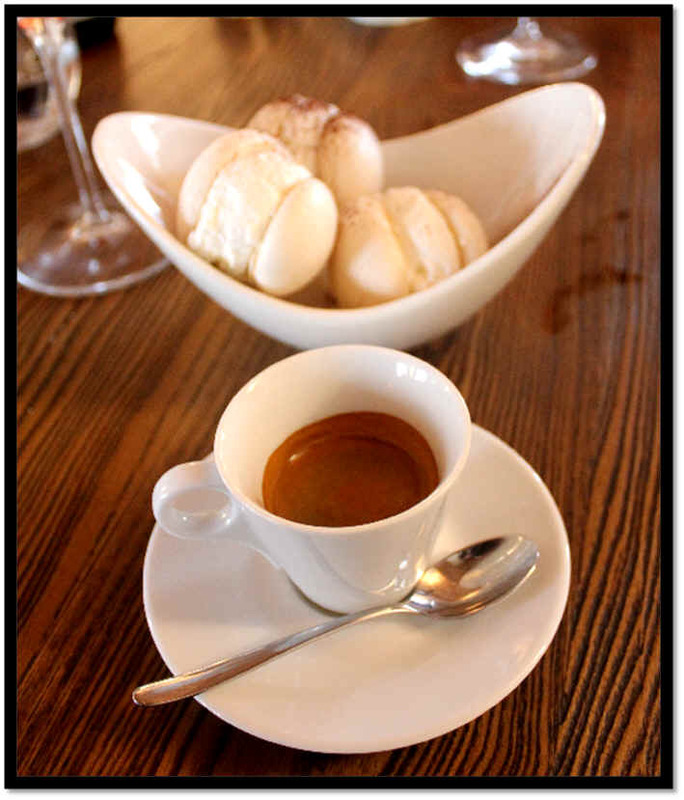 There were a couple of different "secondi" available, so we had both! 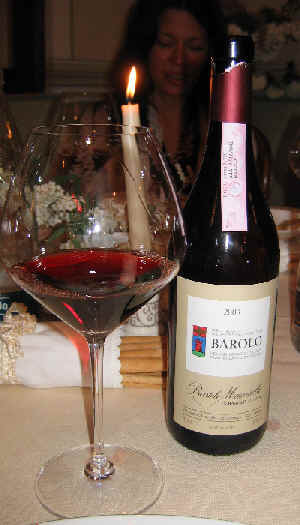 And so it was time to check out another magnum, this one a Barolo from a small Monforte d'Alba producer, Bricco Giubellini. 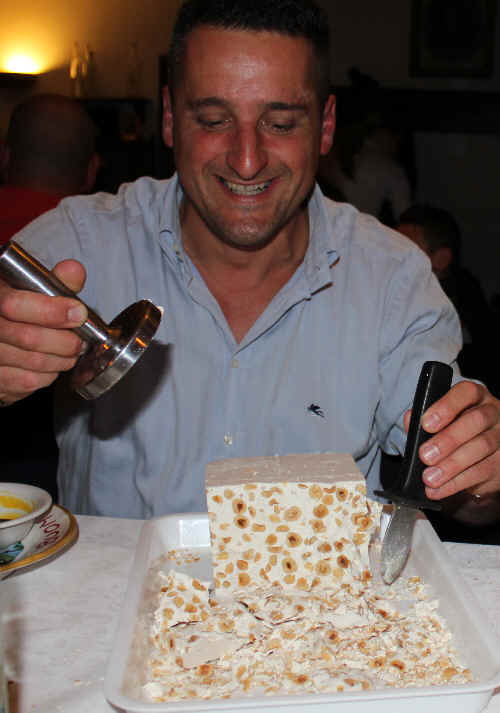 Another interesting facet of this place is Torrone (nougat) is passed around with a couple of tools which are useful in breaking the block into edible pieces. 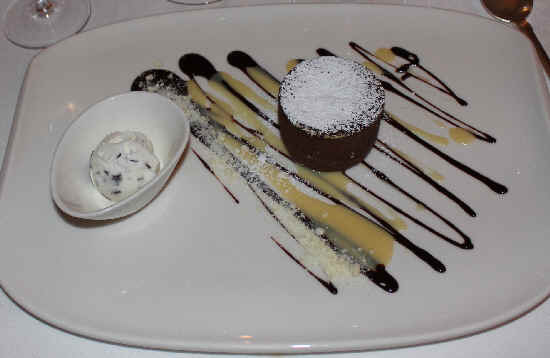 And they have more "formal" desserts, too. 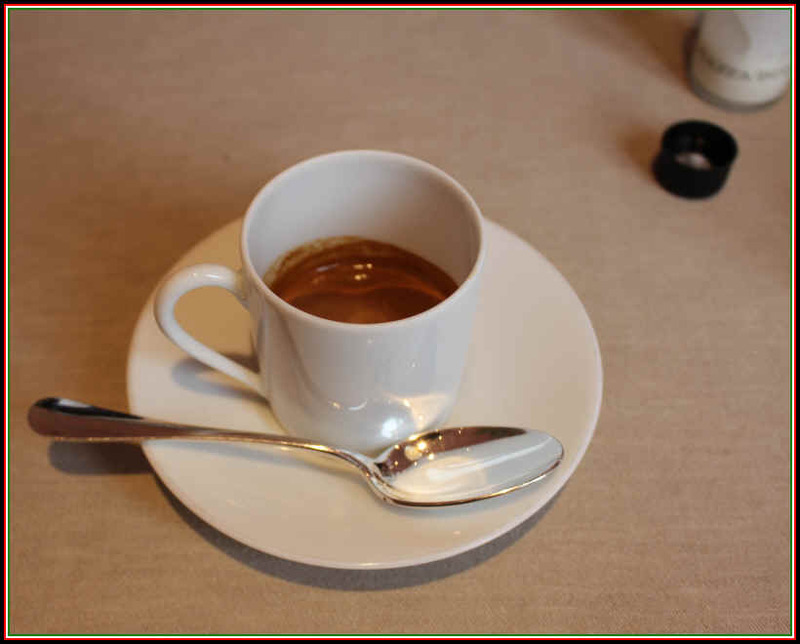 And, of course, there's coffee. 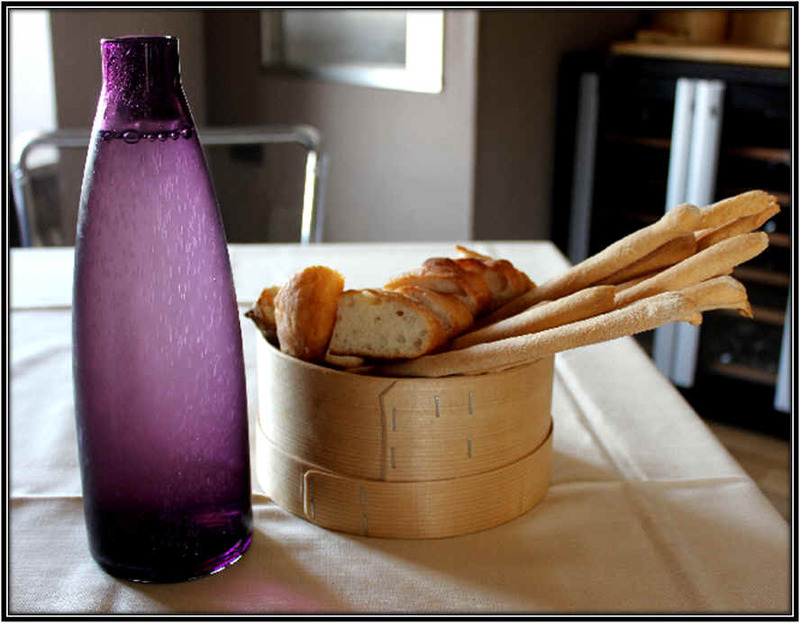 I read recently the cost is 35 Euros per person which includes all the wine, food, grappa, water, etc. This place is located in Moscato country, so you need about 25-30 minutes by car from Alba, driving in the direction of Asti. 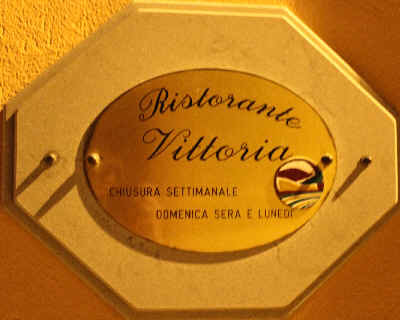 We dined here on a very rainy evening in March. Our friends said "This place is in the country, so they don't stay open as late as some of the places in more populated areas like Alba." 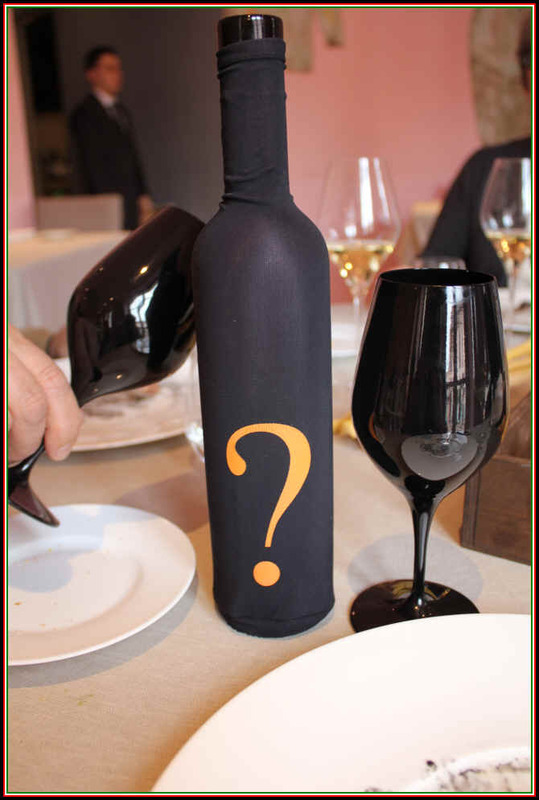 The wine list features a good range of wines without being encyclopedic. It's a Mom & Pop restaurant with dad in the kitchen. Mom was able to pick some wines for us and they tolerated our bringing an older bottle of a Napa Valley Cabernet that is from a favorite winery which our friends enjoyed on their visit to California. 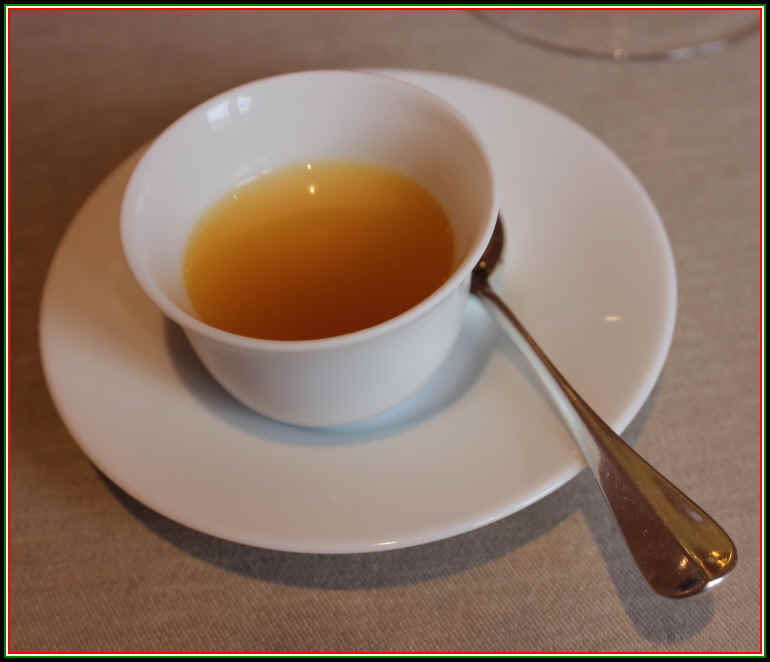 The daughter of the owners was very friendly and she offered advice on the dishes she likes that her dad prepares. 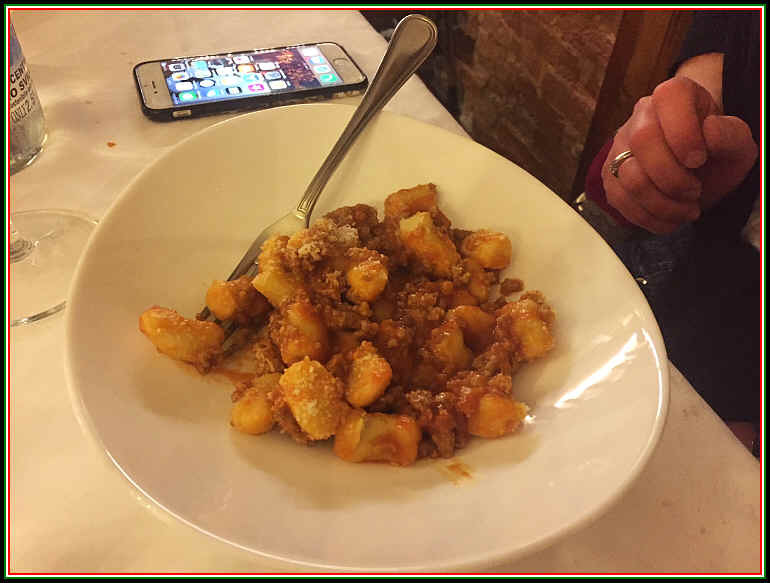 One of our party ordered the Gnocchi. 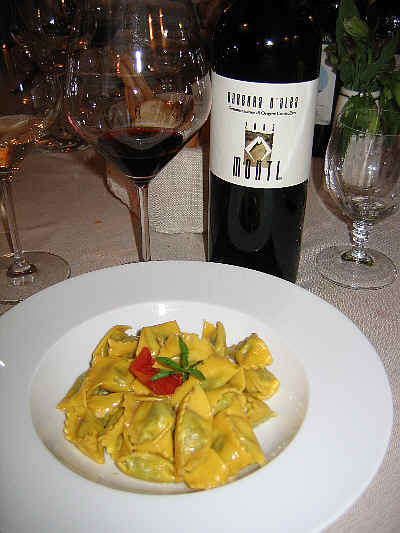 But the young lady told me her Pop makes really good "Plin," Agnolotti. We brought a bottle of California Cabernet to surprise our friends, who thoroughly enjoyed Dunn's 1999. This is a comfortable place if you're in Moscato country. We understand there were some family issues which caused the closure of this place. This is a small, family-operated place...rather informal. Some friends had made a reservation on a Sunday afternoon and we arrived to find this little place hosting a large, family gathering and a few tables for 2 and 4. 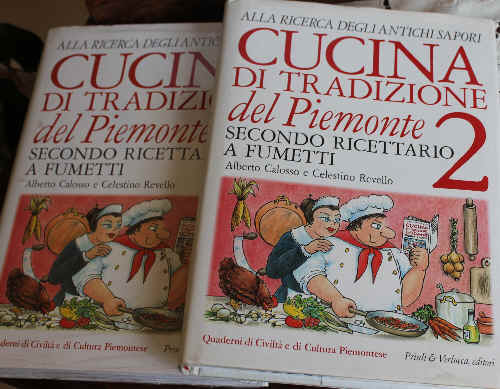 Chef Livio Revello, who's got a nice little cookbook, is the host. 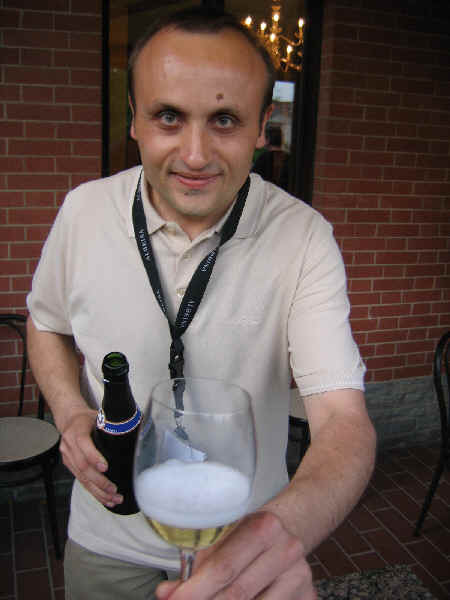 Revello's son also is involved in the place...here seen serving some bubbles to our friends. 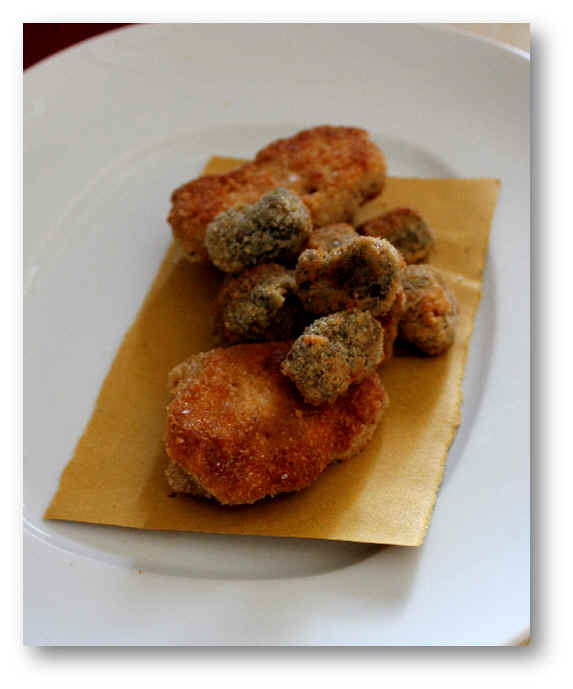 After having a few sips of Prosecco, we sat down at a table and enjoyed a leisurely Sunday afternoon meal. 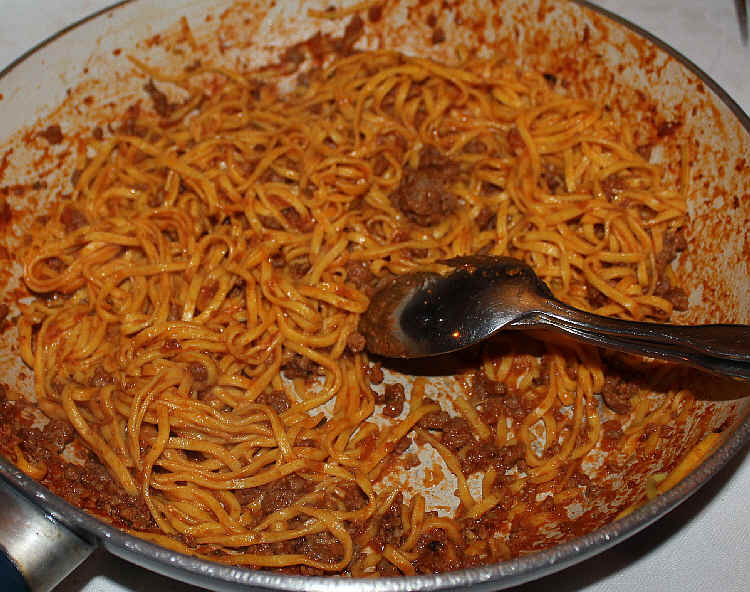 This plate was so simple, yet SO good! One of our party took a snapshot of some joker with a flute wine glass on top of his pointed little head! 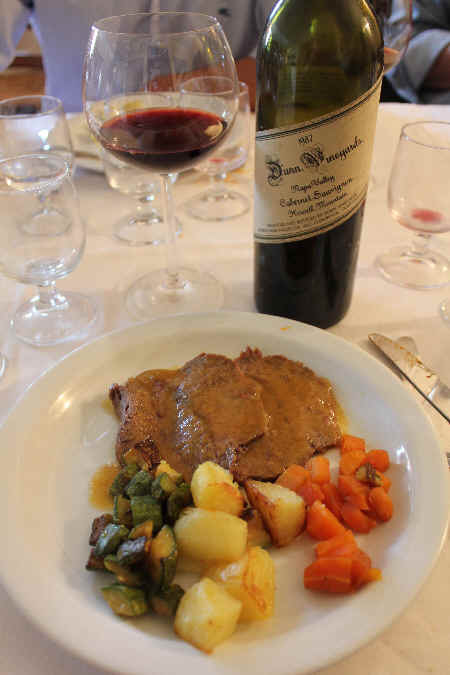 The wine list features many good producers of local wines and we opted for a chilled bottle of Arneis (about 13 Euros) as their red wines are kept in the dining room and are a bit warm. A few beers are available on tap, but we chose to start with a sip of a local brew called Menabrea. 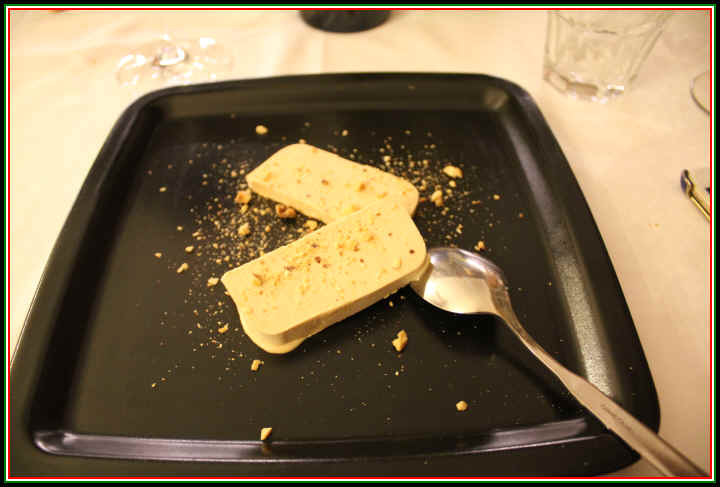 As in most pizza places in Italy, a "pizza" is generally viewed as a "single serving" size and everyone orders their own. The pizza here was good, though the crust was more substantially crusty than classic Naples-style pizza. 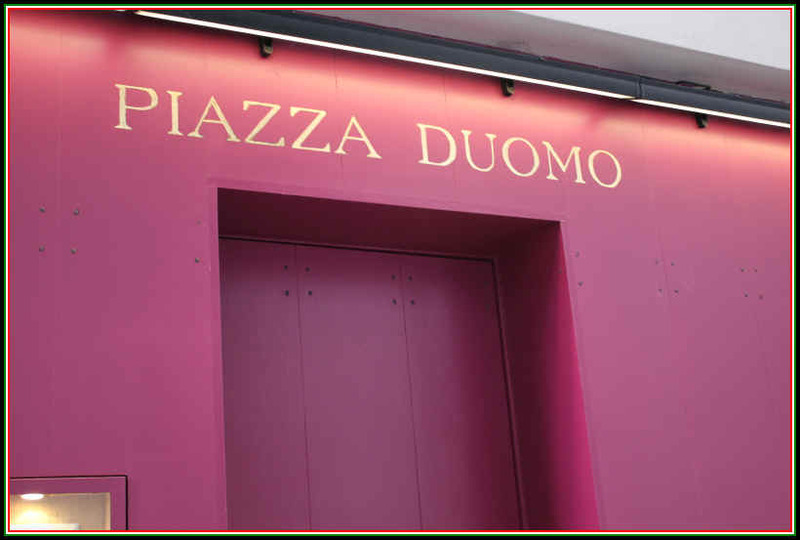 In any case, this is a good place and it's centrally located if you're on a Barolo-tasting excursion. 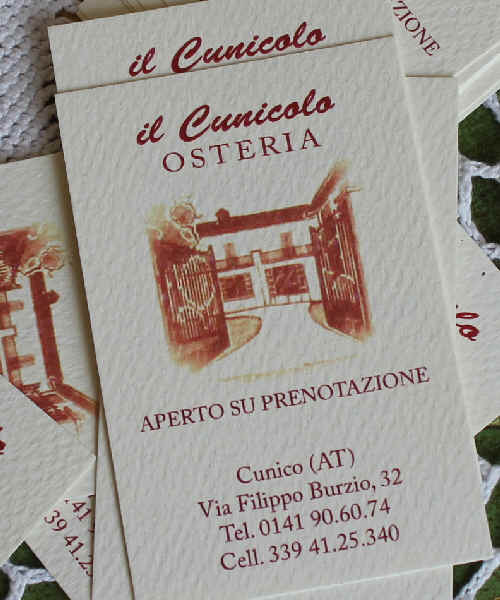 I received a card from this fellow and looked at his web site...he's an artists with what appears to be a comfortable bed & breakfast in La Morra (south of Alba, near the town of Barolo). The place looks nice, comfortable and is sensibly-priced. 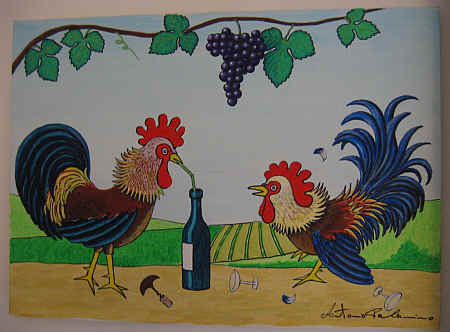 Gallina is a well-known artist and you can see some of his work on the web site. 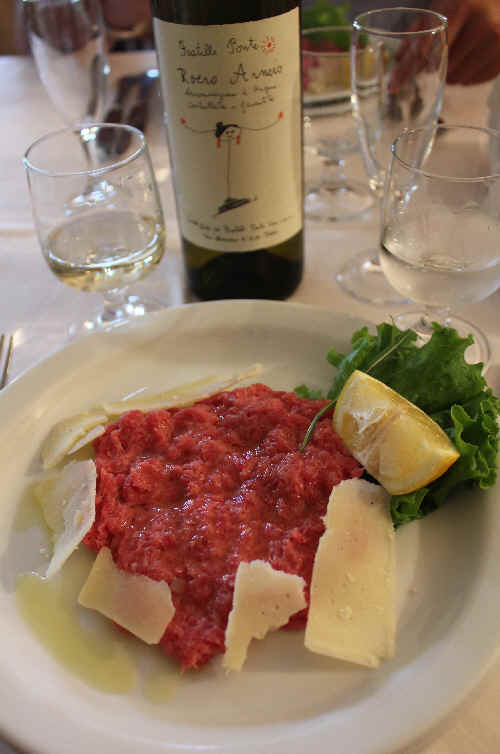 In the process of planning our recent trip to Italy, I came across your "Touring in Piemonte" piece, which was very helpful. We knew we wanted to spend at least a few days in this region, but guidebooks are rather sparse in specifics. 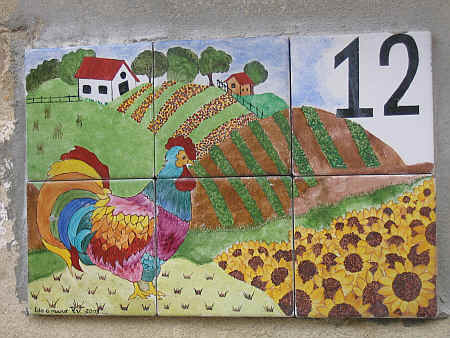 Followed up on the information about L"Atelier Gallina and we stayed three nights there. Pierflavio and Giuliana spent four years restoring an old farmhouse and the results are lovely. 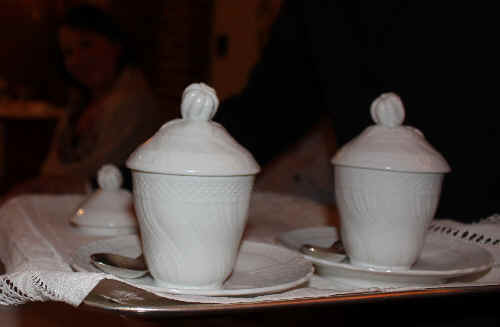 With a mixture of excellent modern appointments and lovely antiques, it is very comfortable and charming. 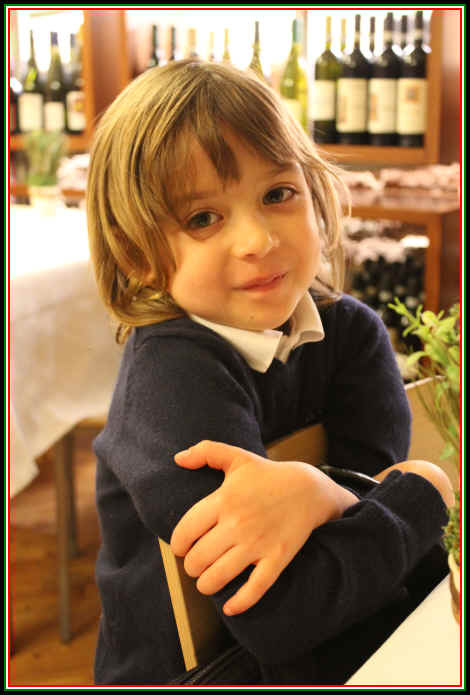 Giuliana's English is very good and she was so very welcoming and helpful. Pierflavio does not speak English but made a point each morning to greet everyone before heading off to one of his galleries. He had an exhibit at the Mondavi winery about 13 years ago and they both spent some time visiting in the area. Thank you so much for this tip and we would certainly recommend it to anyone traveling in the area. 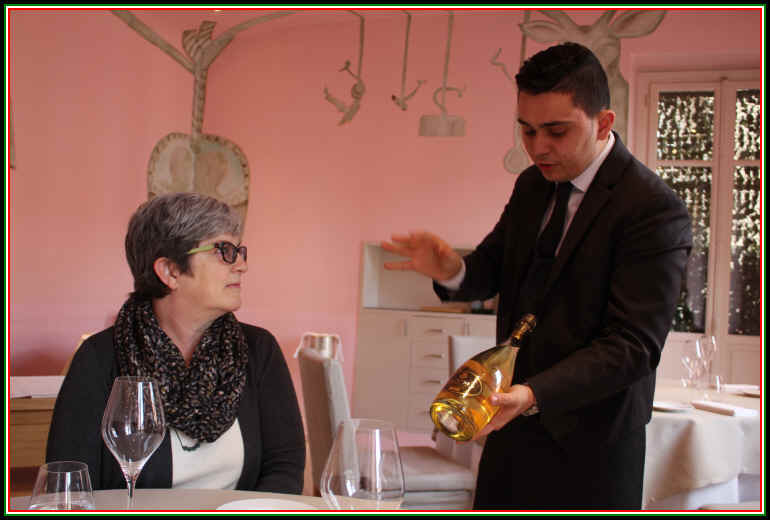 We were asked to send on a hello from Giorgio at Felicin - another great recommendation! 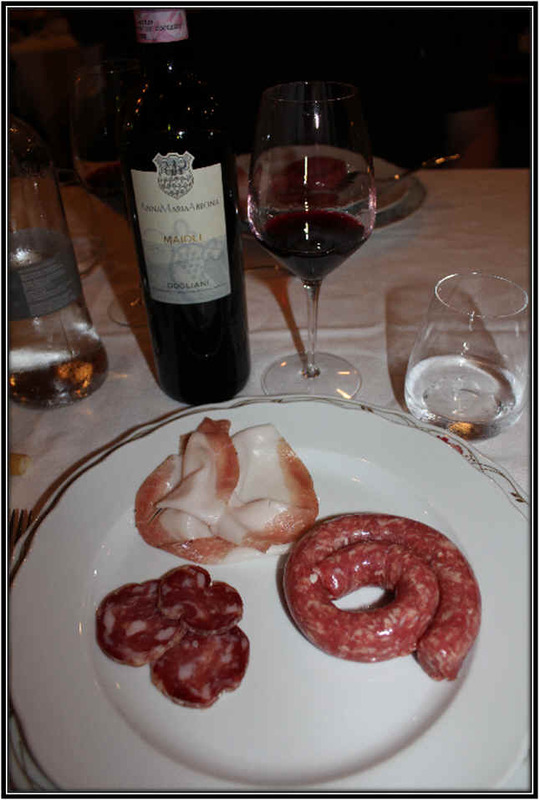 19 Via Giuseppe Garibaldi in Romagnano Sesia (this is well out of the Langhe near the town of Ghemme in northern Piemonte). 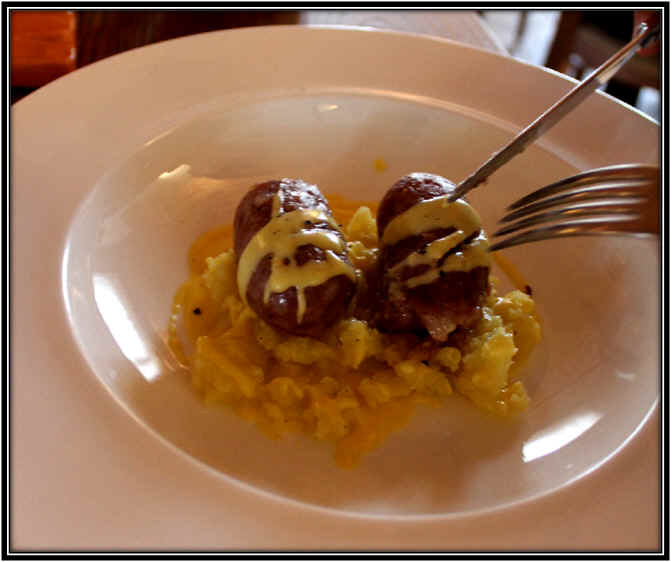 The food is not fancy here, but came highly recommended by a local winemaker. 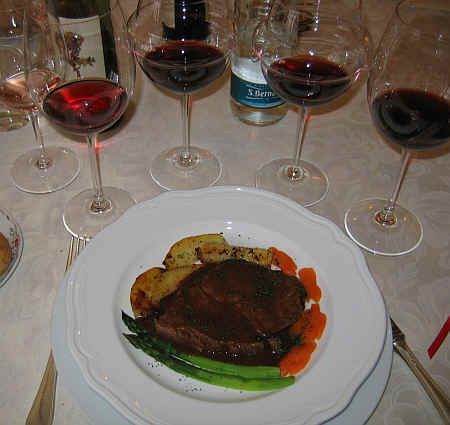 We found the place to offer good vittles and nice wines for a reasonable price. 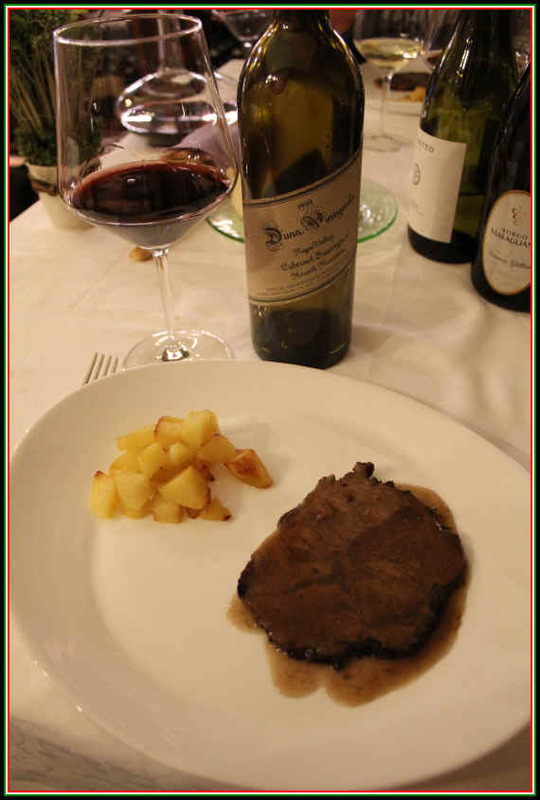 A nice little steak paired very handsomely with a barrique-aged Ghemme from the Ioppa brother's winery. 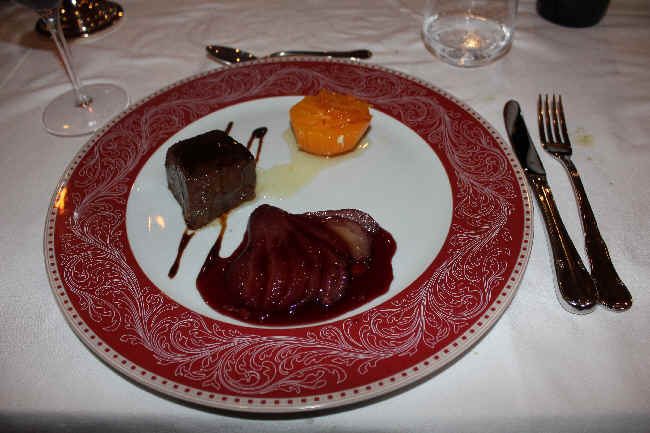 The Michelin Guide gives them 3 crossed knives & forks and indicates a meal runs between 40-60 Euros. 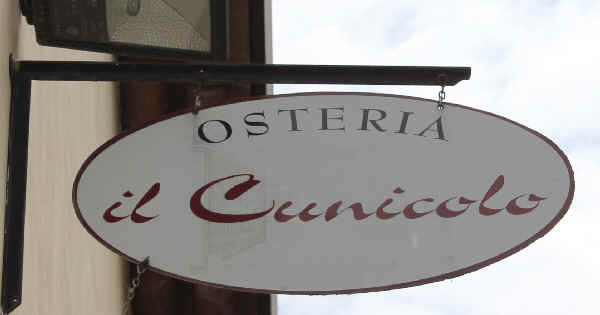 If you're in the area of Asti, this place is worthy of the drive. 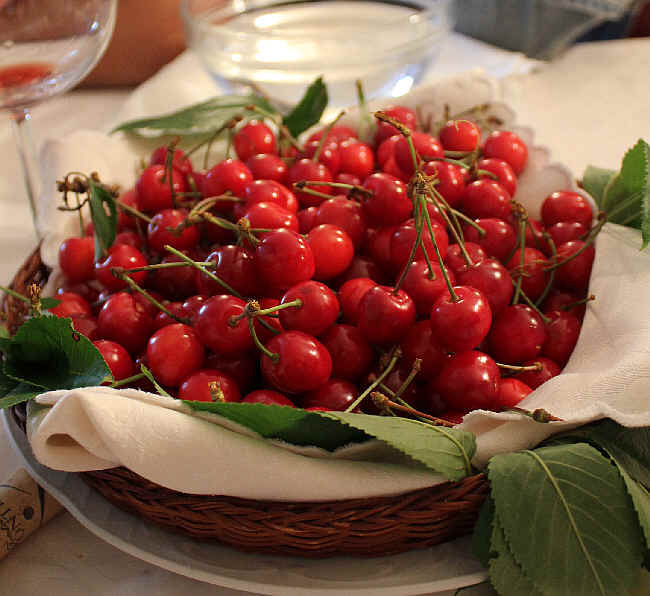 It's all of three kilometers from Castagnole Monferrato, home of a curious and delightfully obscure red wine called Ruch�. 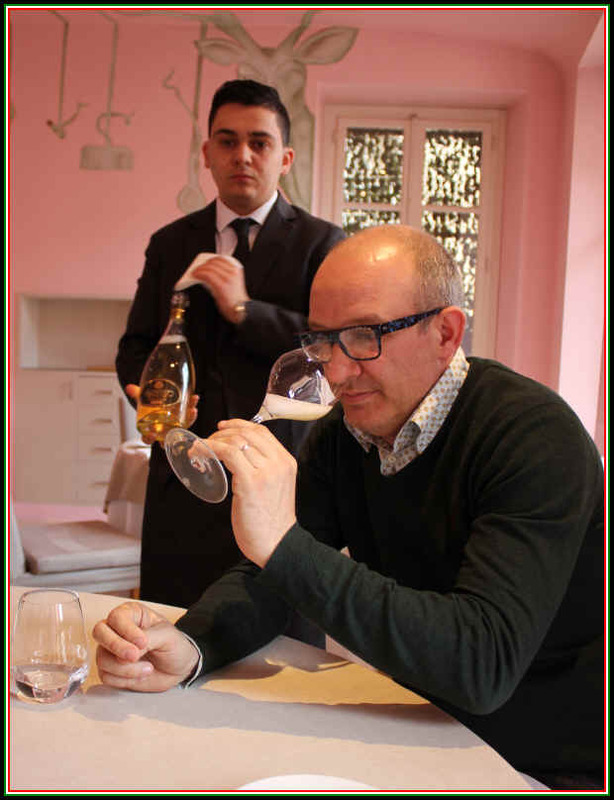 It's a 45 minute ride from Alba and about a 25 minute ride from downtown Asti. 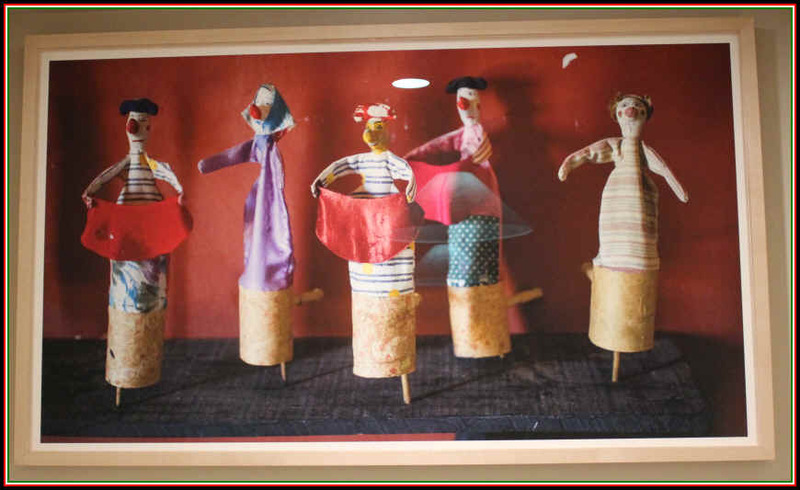 I was struck by some art work I saw on a residence across the street from the restaurant and I found out one of the owners, Antonio Palermino (who's in the dining room with his son Christian) lives there. 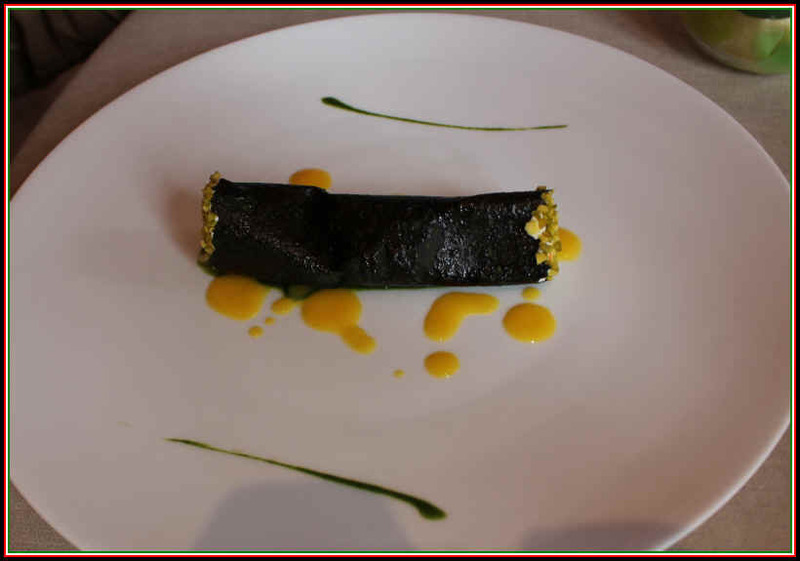 His "art" work graces the various rooms of the restaurant. 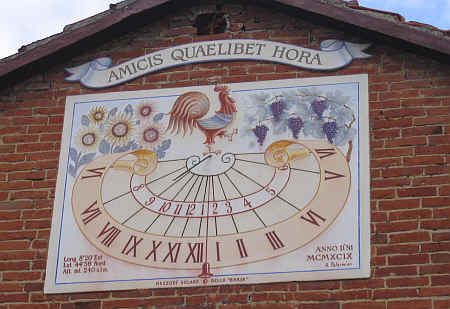 Time for lunch according to the sun dial! 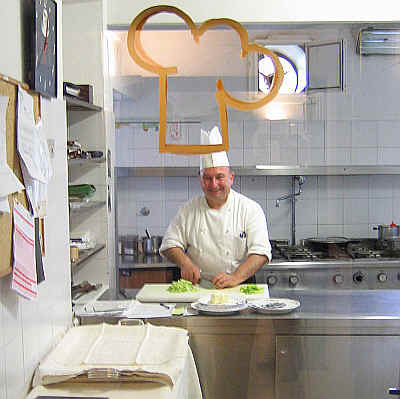 Antonio's brother Giuseppe is the artist in the kitchen. 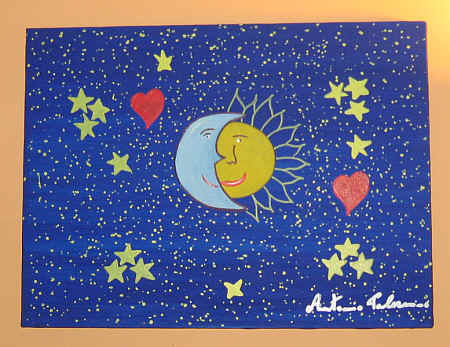 Antonio's son Christian is also an artist. 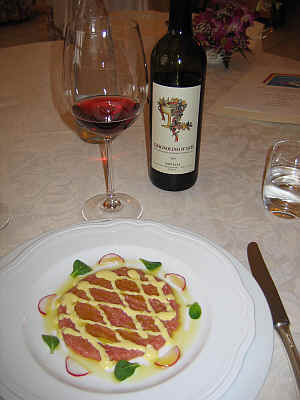 Carne Cruda and Crivelli's Grignolino d'Asti. 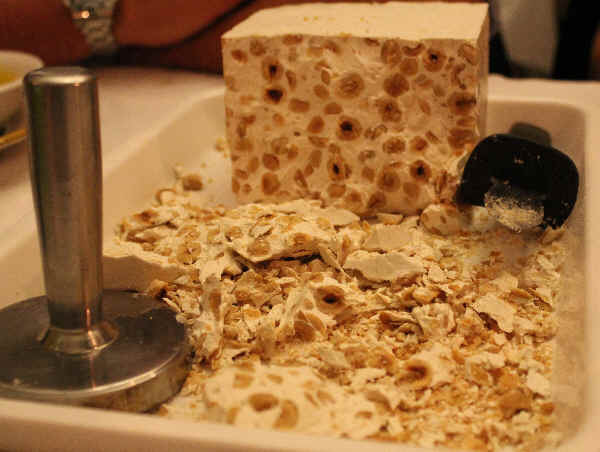 Truffle shavings were the highlight of this plate. 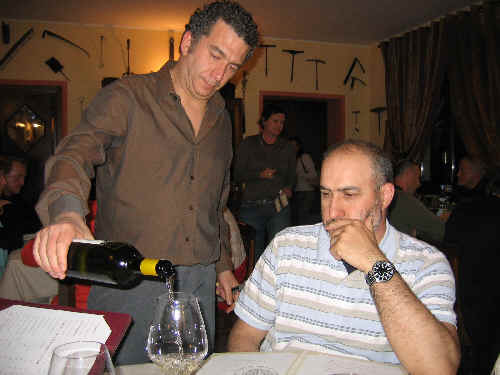 Antonio is certainly passionate about the wines and food they serve. 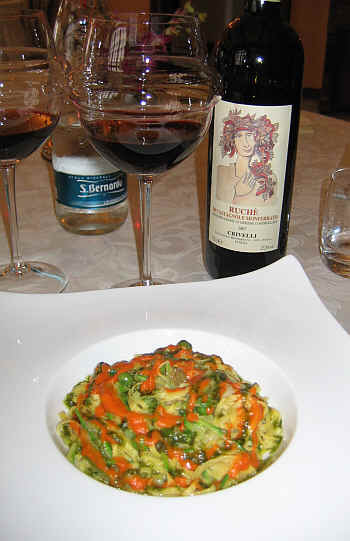 ...and Crivelli's exceptional Ruch� wine. 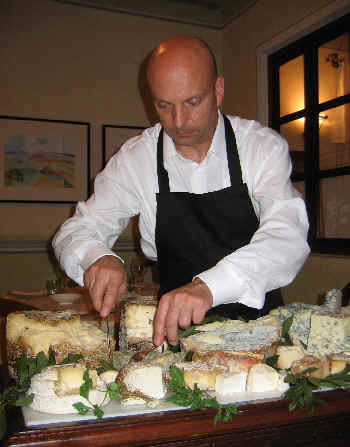 If you're still a bit hungry, the Palermino's feature an impressive cheese trolley. 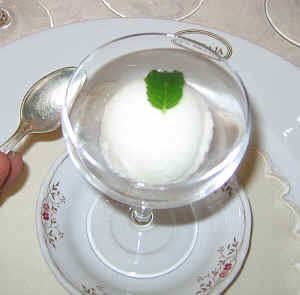 A palate-refreshing sorbet for dessert hit the spot! 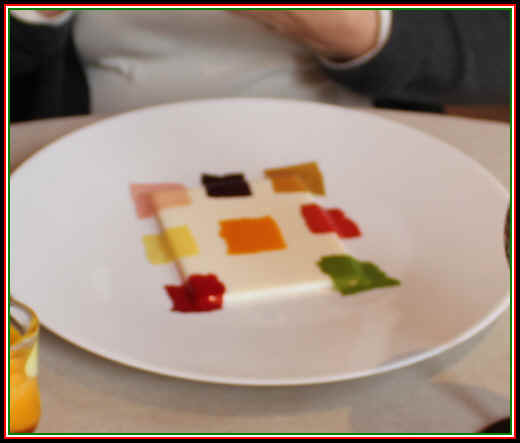 As we were departing, we thanked the chef for his artistry. 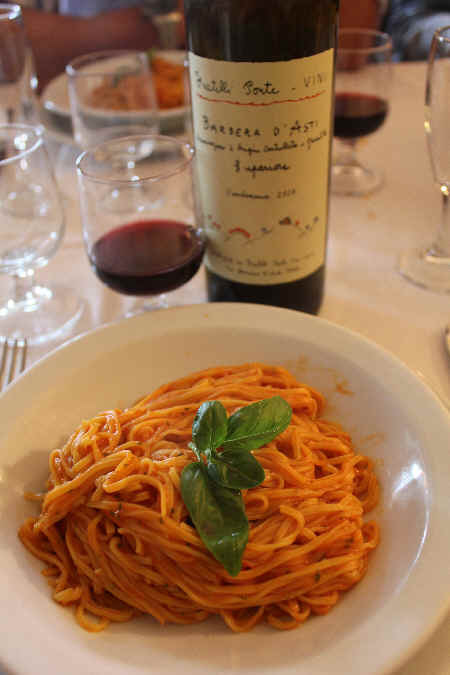 Piemonte is a fantastic region to visit if you're a fan of good wine and good food. While you will find some large producers, many of the top estates are fairly small...almost "Mom & Pop" wineries. 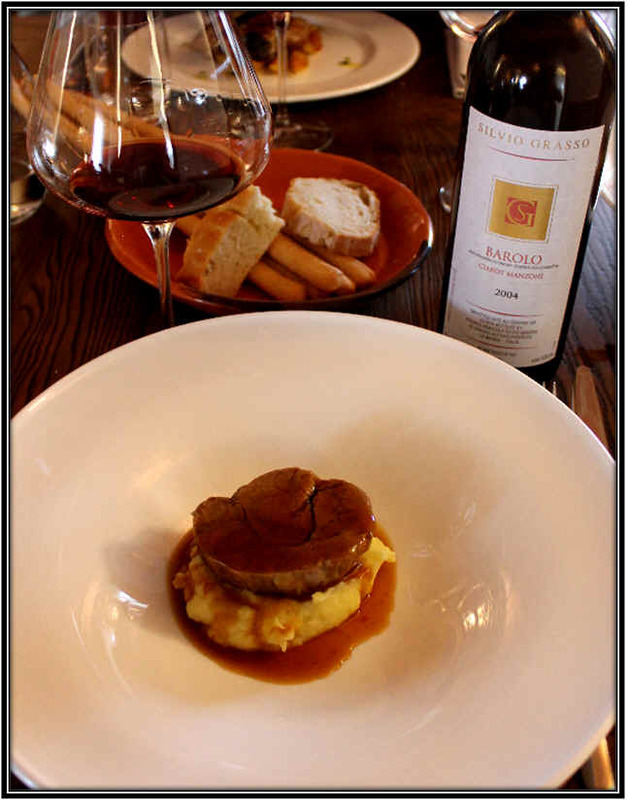 Just a few minutes from "downtown" Barbaresco, winemaker Renato Vacca makes a nice range of red wines. 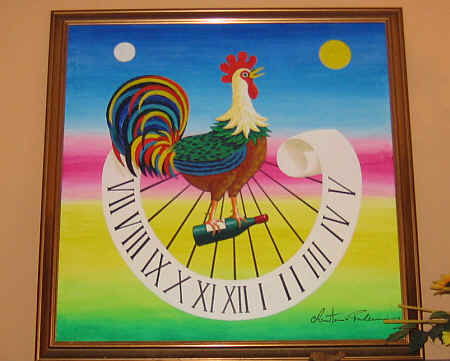 Elio Altare was one of the early modernistas in Barolo. 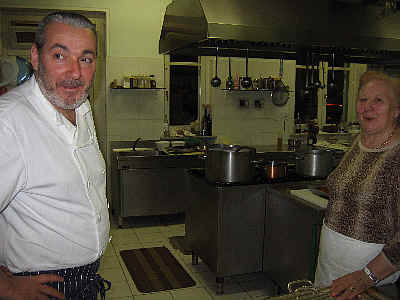 His daughter Silvia runs the place (and she speaks perfect English!). 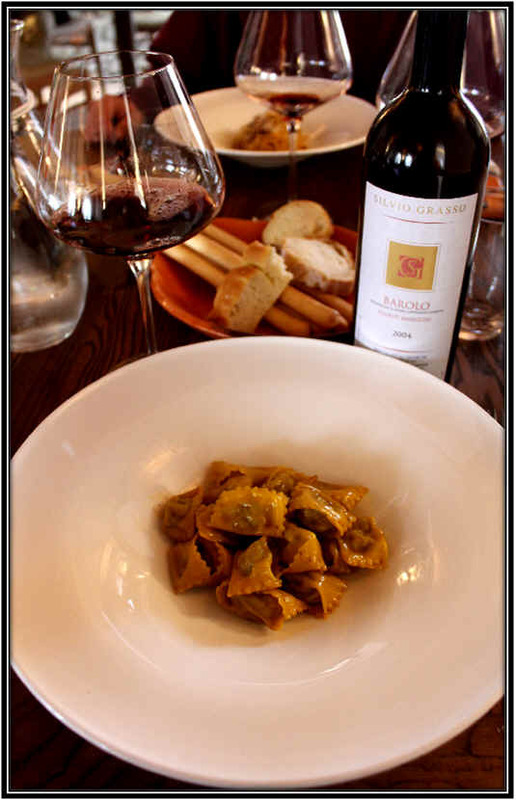 We love their Dolcetto and Barbera wines, here, too. 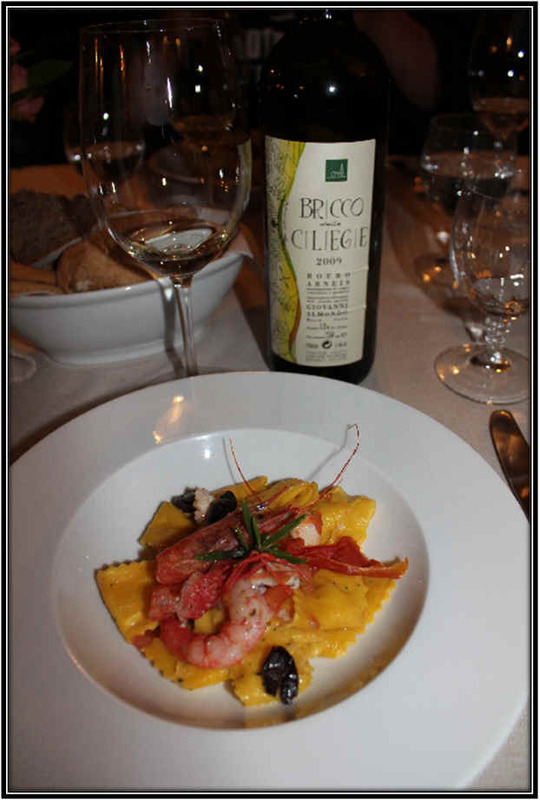 The Vajra family makes some top wines, including a benchmark Freisa (not the fizzy kind), a fine dry Riesling and remarkable pinot Noir. 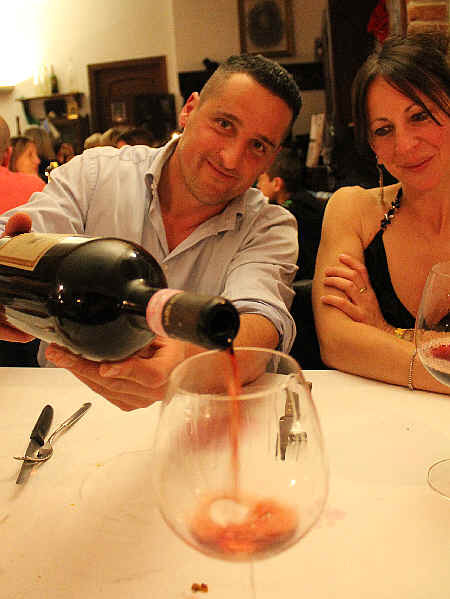 Of course, Dolcetto, Nebbiolo, Barbera and Moscato wines are of interest, too. 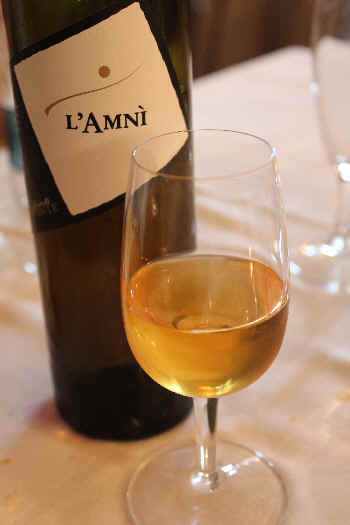 The Damonte brothers made some very fine Arneis wines and some top Roero reds. 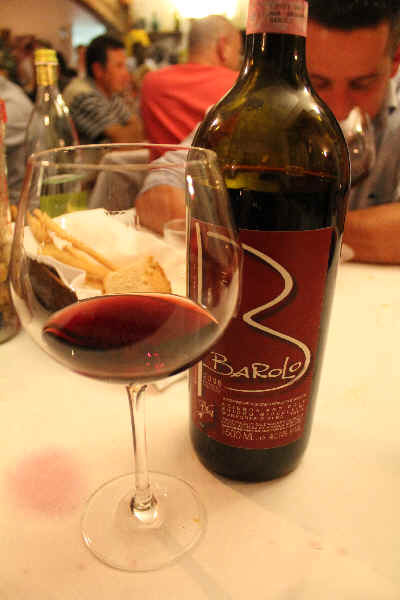 Chiara Boschis is making some delicious wines, including Barolo, Dolcetto and a bit of Barbera. The new tasting room is ready and it has several tables around which to taste. Modern styled ambience. Always impressive wines. Please contact them ahead of time regarding a visit...the web site has a special "contact" page. 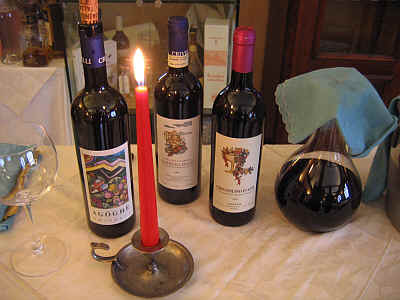 Modern wines of high quality and intensity. 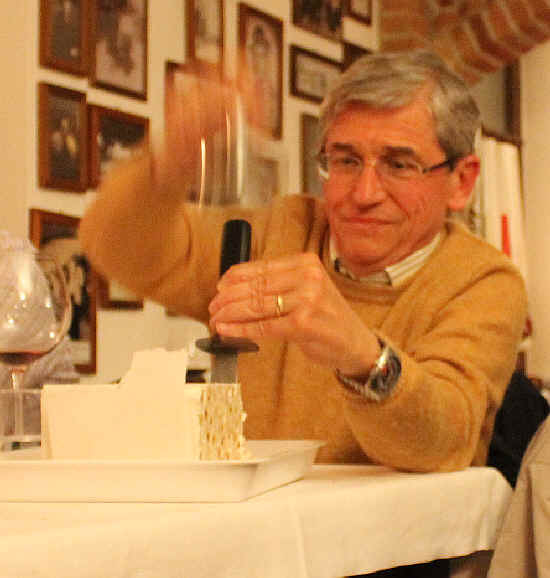 Beppe Caviola not only makes his own wines, he also does lab work and consulting services for dozens of good estates in Italy (mostly Piemonte, but other areas as well). 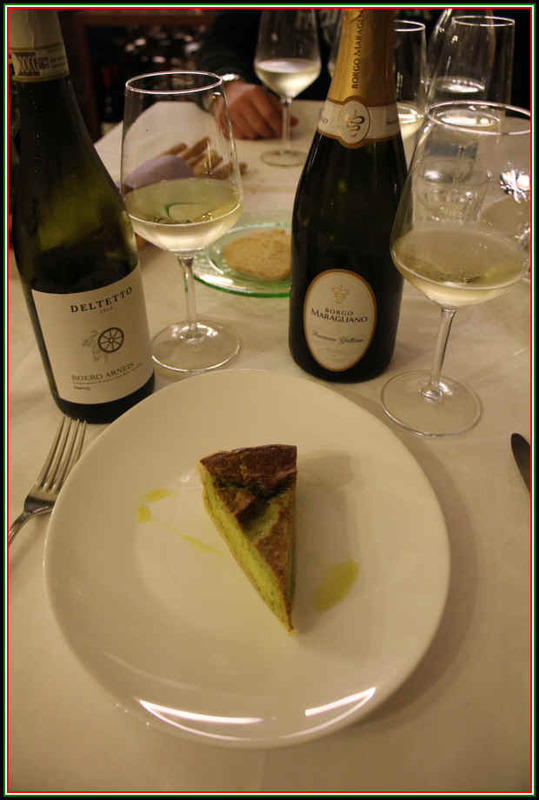 Sergio Germano makes a great range of wonderful wines...even a top, Champenoise-styled Brut bubbly...but very fine Barolo, too. 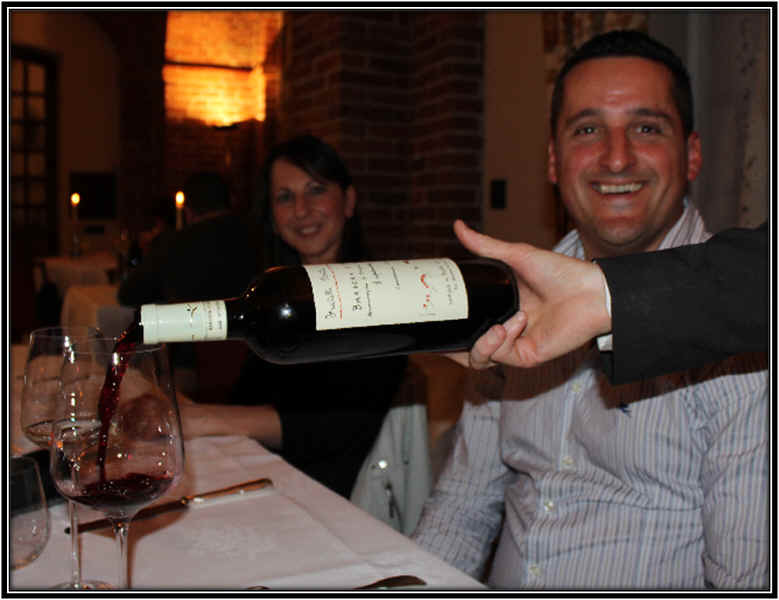 The Ceretto family has had its ups and downs, but I think they're making some good wines these days. 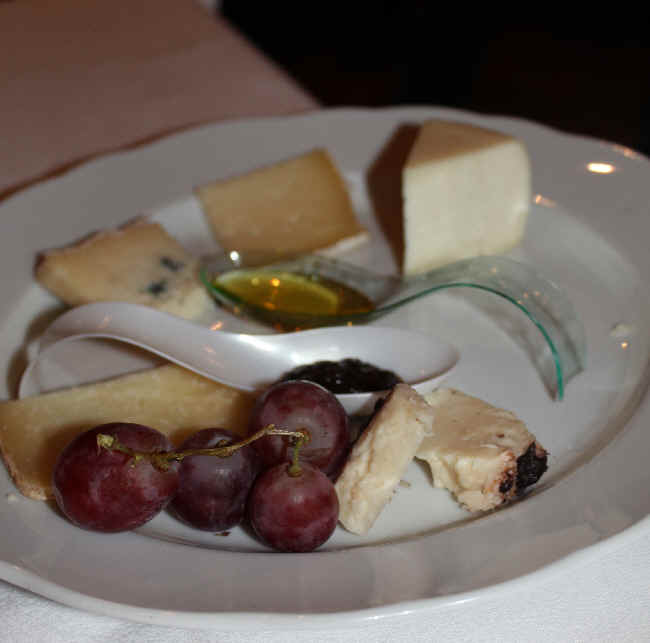 They own a number of winemaking facilities, some for show and others for actual winemaking. This fellow was one of the pioneering "modernistas." He passed away in 2017. His wines are elegant and charming. 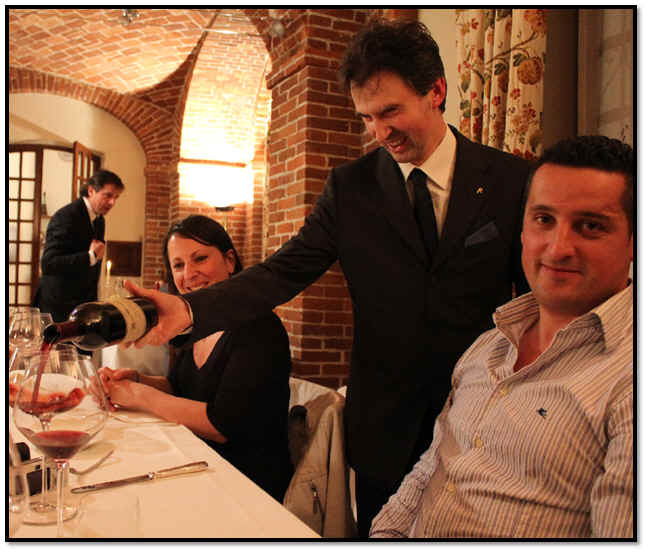 Gaja has typically been closed to the public, but in 2014 they adopted a policy allowing private customers to visit, whereas previously they only opened the door to trade members. If you donate 300 Euros to one of their favorite charities, they will open the door for you. hiking around the vineyards of Barolo! The La Morra site has good maps for those wanting to hike through the vineyards. 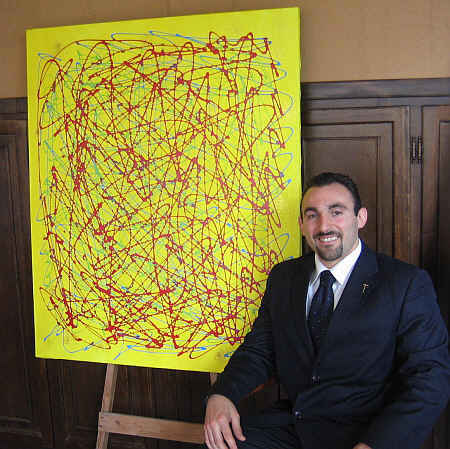 Look for the link to "7 Paths" or "I 7 Sentieri." This web site also has some directions/instructions and maps of various hiking trails.